As we approach the end of 2015, we take time to reflect on the year that was – all the joyous, heart-rending, life-changing and memorable moments. 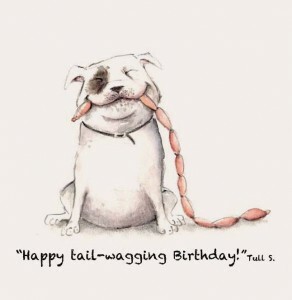 And in light of these occasions, we’re all a little stronger, a little smarter and a little wiser, so let’s celebrate! The following few picture books will give you that extra little reason to take pride in your achievements, and of course, to PARTY! Bring a Duck, Lesley Gibbes (author), Sue deGennaro (illus. ), Scholastic Australia, 2015. If there ever was a book about celebrations it’s ‘Bring a Duck’! When Bear finds a party invitation from Pig in his letterbox, he is ‘tickled pink’! But he is also stumped – ‘Bring your own duck?’ – whatever could Pig have planned? With a cascade of ducks of all sorts, shapes, sizes, outfits and personalities, the party is a flapping success! Young readers will relish the fun of the duck-themed games, events and magic tricks, including duck hunts and stunts and pulling a duck out of a hat. And when it’s Bear turn to host an elephant party, we are immediately inspired to dream up the most imaginative of parties for ourselves! 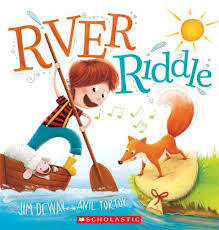 Simply charming and exuberant illustrations team up with the fast-paced, rhyming text that hold our excitement and engagement all the way through. 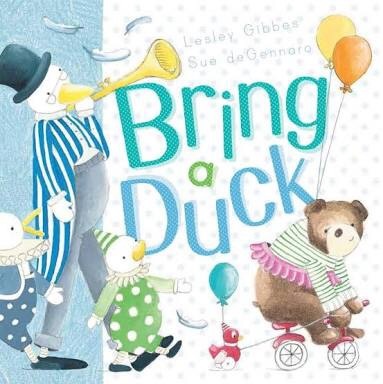 With humour, delight, playfulness and creativity, ‘Bring a Duck’ is a quacking sensation that is sure to invite sentiments of harmony, togetherness, imagination and fun. 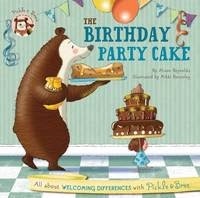 Pickle and Bree’s Guide to Good Deeds: The Birthday Party Cake, Alison Reynolds (author), Mikki Butterley (illus. ), The Five Mile Press, 2015. From one birthday party to the next. It’s a joyous occasion for Pickle and Bree as they plan a party for their Panda friend, Jason. Or is it? 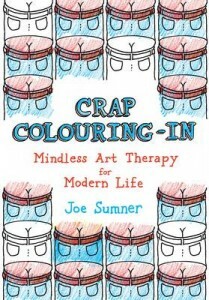 This new, gorgeous series, including ‘The Decorating Disaster’, aims to gently guide its readers to appropriate social etiquette and positive behaviour. So, when Pickle is disgruntled as his bear plans are overhauled by the over-zealous and strong-willed Bree, what’s needed is a fresh perspective. Listening to others, being open to new ideas and accepting differences are just some of the valuable lessons Pickle and Bree learn from their experience. These points are neatly tied together at the end with a list of Good Deeds to acknowledge and reinforce what makes each of us special. But despite the disagreements, we are enchanted by the party-goers’ funny antics, adorable expressions and energy that exude from the pages. 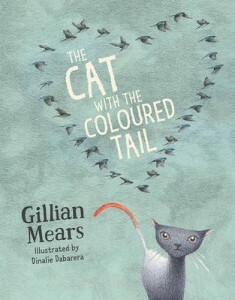 The pastel colours and textures are homely and inviting, and the text encouraging and supportive. Therefore, successfully fulfilling its intention. ‘The Birthday Party Cake’ delicately and sensitively deals with common issues concerning relationships, emotions and tolerance. This enables its readers to value their own and others’ opinions and feelings. 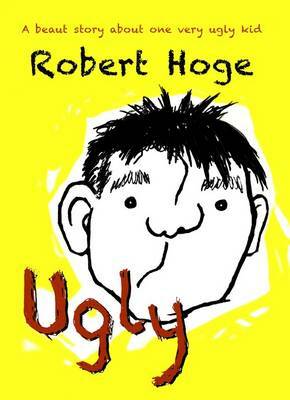 A fun, thought-provoking and relevant story for all children from age four. 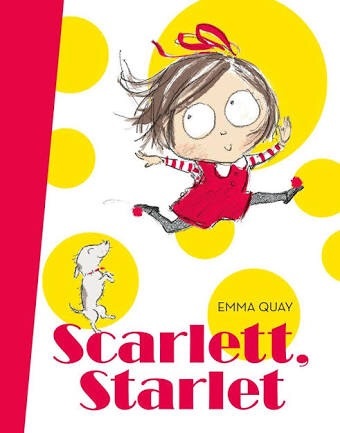 Scarlett, Starlet, Emma Quay (author, illus. ), ABC Books, 2015. From honouring the birthday boy or girl to taking centre stage yourself, Scarlett, Starlet certainly enjoys the spotlight! Scarlett loves to dance. And when she does she is the brightest sparkle in her mummy’s and daddy’s eyes. She spreads rhythm all over the place, and even her puppy Jazzy Jo-Jo loves to tap along. A spectacular stage performance sees Scarlett shine like never before. But in the end she doesn’t need the spotlight, or even her mummy and daddy’s affirmations to know that she is, and always has been, a star! 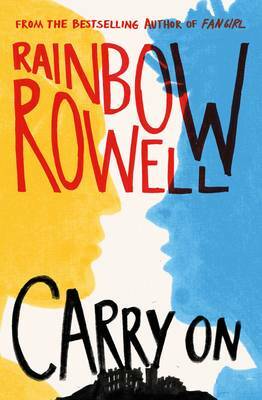 The simple language with its tapping onomatopoeia, repetitive phrases and age-appropriate dialogue beautifully tie in with the basic colour palette of bright red and yellow, which signify strength, power and luminosity just like Scarlett. ‘Scarlett, Starlet’ is delightfully charming; the perfect book for young preschoolers longing to make their mark on the world of entertainment. They will undoubtedly take pleasure in reliving Scarlett’s shining moment over and over again. A, You’re Adorable, Buddy Kaye, Fred Wise, Sidney Lippman (words), Nathaniel Eckstrom (illus. 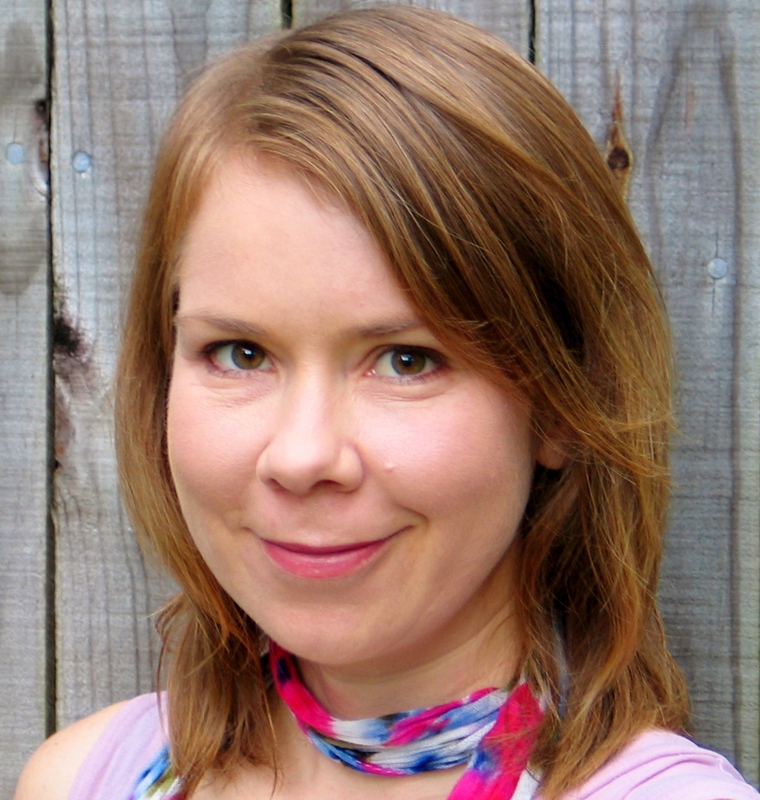 ), Justine Clarke (audio), Scholastic Australia, 2015. There’s no better way to commemorate special people and events in your life than with a song story and bonus CD to swing along to! The well-known, lyrical, alphabetical ode to someone wonderful is gorgeous in this new edition that celebrates the love and pride in those who mean the most. With soft and dreamy illustrations that put all the warmth and tenderness in your heart, as well as the added elements of spirit, charm and curiosity. 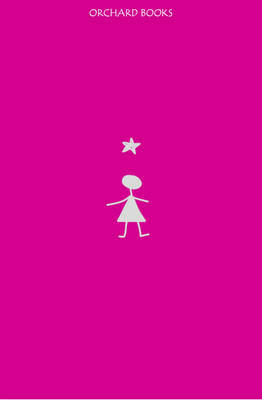 The soulful, Jazzy-tunes of Justine Clarke on the CD ignite that little extra spark to enlighten all the senses. 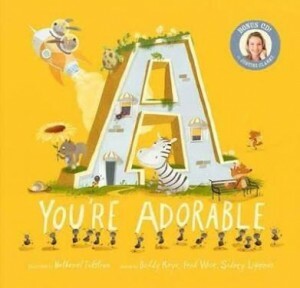 ‘A, You’re Adorable’ is a sweet, melodic book that reinforces alphabet knowledge and feelings of adoration and affection towards our loved ones. Definitely something to appreciate as we look back on the year that was, and the aspirations we anticipate to satisfy in the year ahead. Wishing all our readers a safe and Happy New Year! Looking forward to more bookish excitement in 2016! 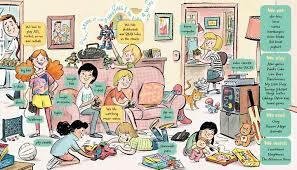 Posted on December 30, 2015 December 1, 2016 Author Romi SharpCategories Book Reviews - Childrens and Young Adult, New Book Releases, Romi SharpTags A You're Adorable, ABC Books, Alison Reynolds, Bring a Duck!, Buddy Kaye, celebrations, Emma Quay, Fred Wise, Happy New Year, Justine Clarke, Lesley Gibbes, Mikki Butterfly, Nathaniel Eckstrom, party, Pickle and Bree's Guide to Good Deeds, resolutions, Scarlett Starlet, Scholastic Australia, Sidney Lippman, Sue deGennaro, The Birthday Party Cake, The Decorating Disaster, The Five Mile Press1 Comment on It’s Time to Celebrate! Simon Vs The Homo Sapiens Agenda by Becky Albertalli is basically the definition of endless cuteness, teenage angst, growing up, and finding love. Did I mention cute? 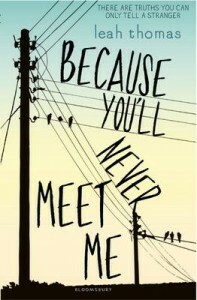 THIS BOOK = CUTE. By the end I was basically grinning like a deluded mushroom while I read! I was recommended this book copiously and I can 100% assure it it’s worth it. It’s perfect. It’s basically about Simon who is not-so-openly-gay and his internet friendship with the anonymous “Blue”. It’s about Simon’s life, his drama class, his best friends, and it’s about growing up — changing. It’s written SO realistically and beautifully. First of all Simon is awesome. He has a more jovial, joking, lighter personality. He hugs people and jokes and is easy to get along with and very, very relatable. He overthinks and he’s angsty — but he’s not suffocatingly intense. I felt he was refreshing and enjoyable to read! This book has food. Don’t underestimate the power of writing about good food and luring in readers that way! Although, I confess: Simon has an intense love of Oreos and I have never eaten one. But after this book — I want to. The romance is so squishily adorable. Simon’s slow building friendship, and then romance, with “Blue” is just glorious to read. It’s cute and fun and I loved the mystery of “who IS Blue”. Their friendship is exclusively emails. Blue doesn’t want to meet up in real life. I absolutely related to the ease of online friendships (though of course these two didn’t stay friends…eeep. So adorable!) I did get frustrated at Blue at times for some of his more selfish actions, but humans can be selfish. So he’s flawed! That’s a good thing! 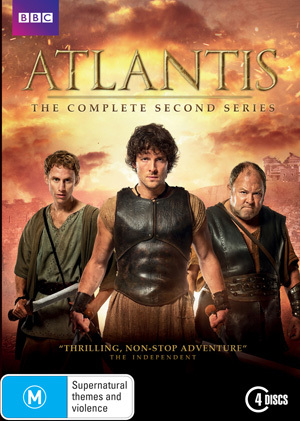 Which leads me to say: I love how the characters were flawed but likeable. They felt like “real” people! Trying to figure out who “Blue” was (since Blue goes to Simon’s school) was one of my favourite parts! 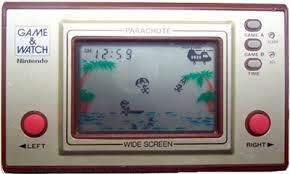 IT WAS SO FRUSTRATING. (Obviously that’s a good thing.) I didn’t once guess right either, so the mystery, clues, and reveal are all impeccably done. 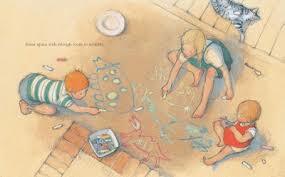 The book also focuses very heavily on friendships. Simon has a tight-knit group of friends: Nick, Abby, and Leah. I really loved Abby (she was just so bubbly and fresh and compassionate) and I thought Nick was about as interesting as a paper fork. I did struggle with Leah’s character, but again…even if she was insufferable, she was still realistic. The writing was really crisp and to the point. Even if sometimes the scenes did cut off a little too abruptly? 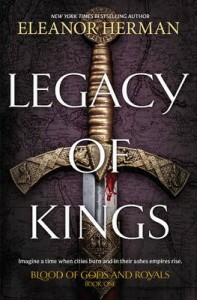 Knowing this is a debut, though, makes me 10000% sure that this author’s next book will be FLAWLESS. 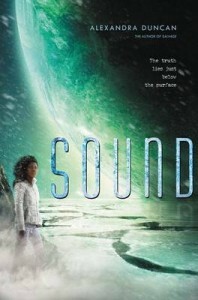 I can’t sing my praises for this book loud enough! 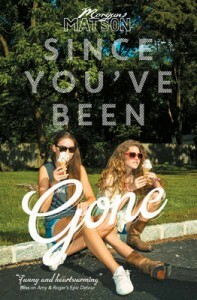 It was part mystery, part coming-of-age, and part love story. And it flowed so seamlessly and definitely will be a book I want to revisit. Plus it was funny and managed to be lighthearted AND balance the darker topics. This book is an oreo of perfection dunked in addictiveness with a good helping of hilarity and perfectly wonderful characters on top. It’s nearly 2016 (sheesh, how did that happen?!?) and, if you’re anything like me, there’s no WAY you’ve read all the 2015 releases that you wanted to. And pretty soon there’ll be an onslaught of NEW books that will demand your attention and your soul and other minor things. But there are several Young Adult debut authors you really cannot miss. Especially when most of them have new books coming out in 2016! 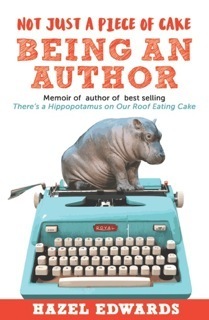 Debut books can be tricky beasts, because often you can tell the author isn’t a pro yet. But this list? Ohhhh, my friends, these authors are already so stunningly talented, I can barely WAIT to see what their next novels will hold! 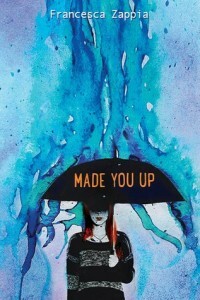 MADE YOU UP: This is such an important book because it’s about a girl with schizophrenia, but it’s not about her schizophrenia. Her illness doesn’t solely define her, and I think that’s a really important message. Plus it’s gorgeously written. THE SACRED LIES OF MINNOW BLY: Okay but WOW, this book is creepy! It’s about cults and murders and juvie — and the protagonist has no hands. 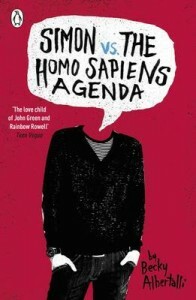 SIMON VS THE HOMO SAPIENS AGENDA: This is probably the most adorable LGBT book of the year. All the characters are entirely relatable and realistic. Don’t get me wrong — I do love a contemporary where the characters wax poetic with soliloquies of love and meaning. But I also love books that are awkward and realistic. Plus there are Oreos in here. So. many. Oreos. THE WRATH AND THE DAWN: Definitely one of my all time favourite fantasies!! And it’s only a debut?! 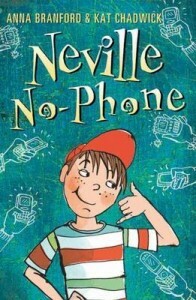 So I can only imagine the talent this author is going to bring to the table over the years! 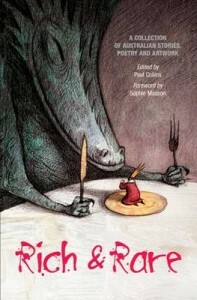 It’s a Persian folklore retelling of A Thousand and One Nights and has a good dash of magic with a mountain of delicious food descriptions. 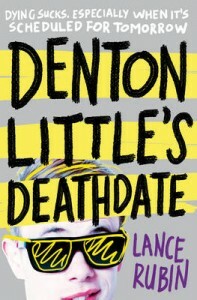 DENTON’S LITTLE DEATHDATE: This book is hilarious. 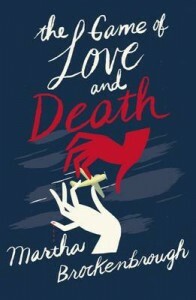 It makes fun of death rather ridiculously…so make sure you’re okay with gallows humour before devouring this! BECAUSE YOU’LL NEVER MET ME: This one is told in letters between two boys with unusual disabilities. One is allergic to electricity. 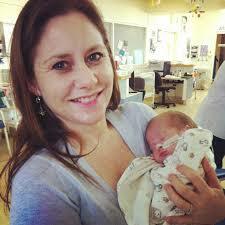 One was born with no eyeballs and has a pacemaker. Ergo — they can never meet or they’d kill each other! But the character development is phenomenal and you’ll never guess the ending…. 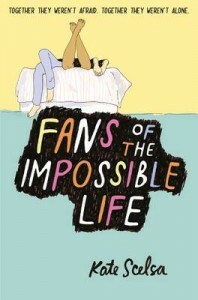 FANS OF THE IMPOSSIBLE LIFE: Another super realistically cute contemporary. Why is this one special?! 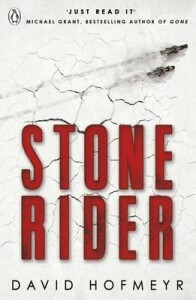 It’s narrated by 3 characters in 1st, 3rd, and 2nd person! 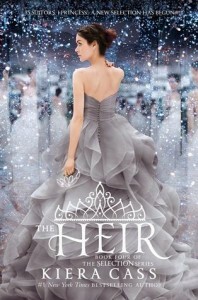 The characters basically burst off the page and one character has chronic-fatigue, which I hadn’t read in YA until now! 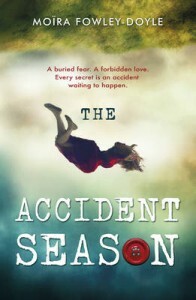 THE ACCIDENT SEASON: It’s beautiful. Absolutely mind-stunningly beautiful. It’s kind of an eerie book, set in October, so it’s all pumpkins and autumn and Halloween. And it’s magical and mysterious and — did I mention — the writing is gorgeous?!?!? 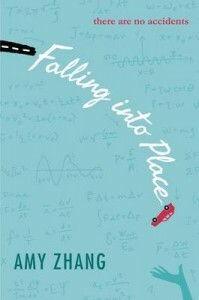 FALLING INTO PLACE: This is written by a 16 year old author. TALENT ALERT. It’s not the average contemporary either, because it’s narrated by a childhood imaginary friend. Unique, right?! It’s written in tiny chapters and it’s barely 300 pages so you can eat it in two bites, basically. 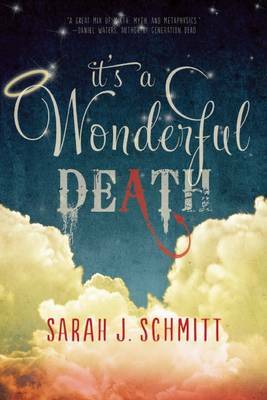 The author has two books coming out in 2016, so her debut is a MUST read before they arrive! It’s hard to find a blog’s worth of words to say what I can really say in one sentence: Star Wars: The Force Awakens lives up to the heady hype and breathless anticipation. I mean really, I’m pretty sure today we’ve heard the collective happy exhalation slash fist pumping of Star Wars fans the world over. I’ve yet to hear one say the film didn’t live up to their expectations. Of course, it’s easy to say now I always had faith in JJ Abrams’ ability to execute an on-song film, but I did. He obvs has a strong track record, the Star Trek reboots being the most recent, but he is also a master at drawing out the key narrative elements and enhancing them. Which is exactly what he did here. Balanced with just the right amount of action meets heartstring-tugging meets fantasy meets comedy, this Star Wars iteration impresses. Its look and feel is accurate. More importantly, its tone feels right. 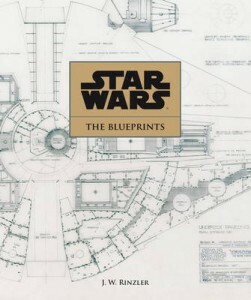 In a nod to episodes past as well as a clever way to link the past and the present, TIE fighters, X-wings, the Millennium Falcon, and the Deathstar return in various forms (I for one have spent plenty of time poring over their blueprints). As do some of the most beloved characters. But the film is carried by a cast of next-generation relative newbies—arguably in George Lucas’ tradition, but still much more than I’d expected, if I’m honest, but hats off to it. These newbies include a modern droid that is Wall-E-like in nature, but mostly endearing rather than abundantly annoying. Is it just me, or did anyone else find Wall-E annoying? And BB-8 was cute, but only in small doses. I felt it was overdone in early scenes, but the rest of the film reigned it in. There was, of course, also a resourceful junk scavenger named Rey, who upends stereotypes about which jobs women are or aren’t good at. In fact, she executes my favourite joke of the film—‘No, no, no. 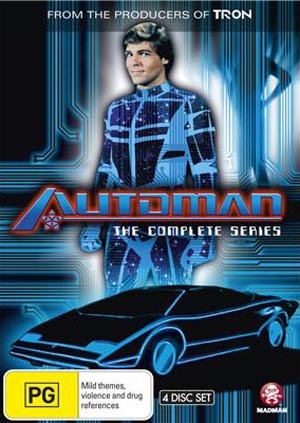 The one I’m pointing to.’—which is one about asking her male co-protagonist to hand her a spanner. In fact, there was a fair amount of role reversal in this iteration. The women are strong and centre stage and less sexualised—more so than in the past. There’s Rey, of course, but Leia too, and no gold bikini in sight. There’s also a brilliant, bespectacled, oracle-like woman Maz (Lupita Nyong’o), whose opening words to Han Solo were: ‘Where’s my boyfriend?’ It turns out she’s a fan of the Wookie. She’s so incredibly compelling she just about steals the show. 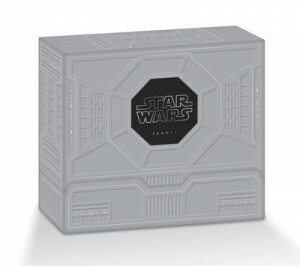 I don’t want to give to much away about the film, but I will say it’s a crowdpleaser—sentimental but not soppy, and a return to Star Wars form. Forgive me for admitting I actually cried at one stage when the Resistance fighters appeared. ‘This is so not how I thought this day was going to go,’ Han Solo says in one scene, as things go pear-shaped. But I’d prefer to recast this: This film so didn’t go how I expected it to. And for that, and the fact that Jar Jar Binks remains banished, I am entirely thankful. 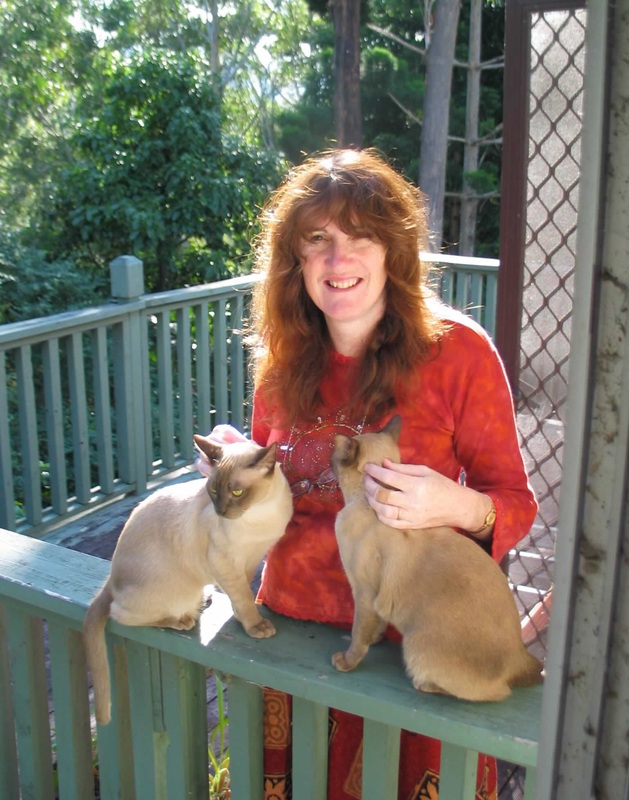 Melissa Keil is the author of two of my favourite YA novels, The Incredible Adventures of Cinnamon Girl (2014) and Life in Outer Space (2013). Thanks for speaking with Boomerang Books, Melissa. Where are you based and how involved are you in the YA lit world? I’m based in Melbourne, but get to travel around a bit for writers’ festivals, school visits and so forth. The YA lit world is pretty amazing in Australia – apart from the festivals and speaking gigs, I get to catch up with other authors pretty regularly at launches and other events. It’s a lovely, supportive world to be part of. 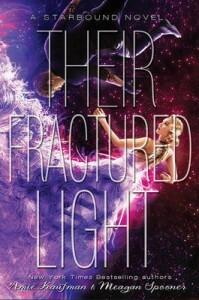 How did your first YA novel, Life in Outer Space, get published? Which awards has it won or been shortlisted for? My first novel was the winner of the inaugural Ampersand Prize run by Hardie Grant Egmont, who, at the time, were looking for real-world manuscripts from unpublished YA authors. I think it was just one of those magical moments where the stars aligned and the manuscript just landed in front of the right people at the right time. 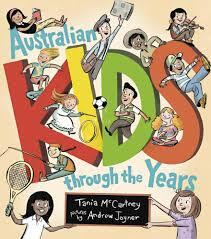 It’s been nominated for a few things, including the Prime Minster’s Literary Award, The CBCA Book of the Year (Older Readers), the Gold Inky, the Western Australian Premier’s Book Awards. 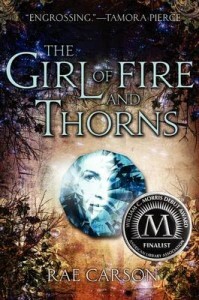 It was the winner of the Ena Noel Award, and it was also a YALSA Best Book for Young Adults in the USA. 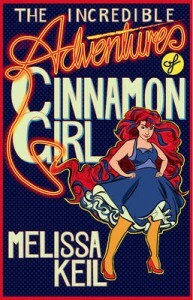 There’s still a buzz happening around your second novel The Incredible Adventures of Cinnamon Girl. Which awards has it won or been shortlisted for and what’s happening with it now? Thanks! 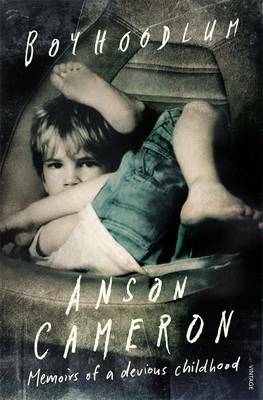 Cinnamon Girl was shortlisted the Gold Inky Award, the CBCA Book of the Year (Older Readers), the Western Australian Young Readers Book Award. 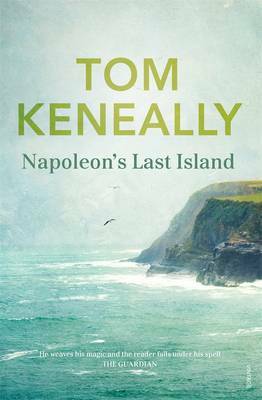 The most exciting thing that’s happening at the moment is that it’s getting ready to be published in the US and UK early next year. 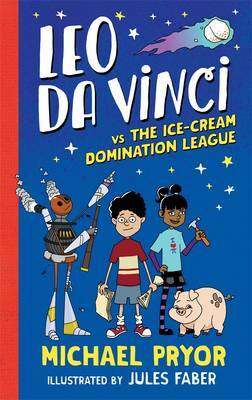 Both publishers have chosen quite different (but amazing) cover looks, and the US edition has been illustrated by a fantastic comic book artist called Mike Lawrence. I’m looking forward to seeing her out in the wider world! Why do you think these books resonate so strongly with readers? That’s a hard question! All I can say is that I write the characters who I love and connect with, whose worlds I want to be immersed in. They feel like real people to me, and I hope that that translates onto the page. I started out as a children’s book editor, and as part of my job, wrote lots of books ‘in house’, mostly junior non-fiction and preschool early-learning type books. 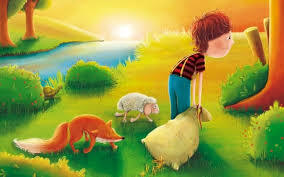 I’ve had a picture book, Rabbit and His Zodiac Friends, published. I also have lots of half finished books and short stories in my bottom drawer! I’m finishing up my next novel, tentatively titled The Secret Science of Magic. It’s been one of the most challenging things I have written so far, but I’m on the home stretch with it now. The last book I read was Vikki Wakefield’s Inbetween Days, which was just beautiful, with some wonderfully complex and well-realised female characters and relationships. I’ve just started reading Carrie Brownstein’s Hunger Makes Me a Modern Girl, which I’ve been looking forward to reading for a long time. Christmas is coming. 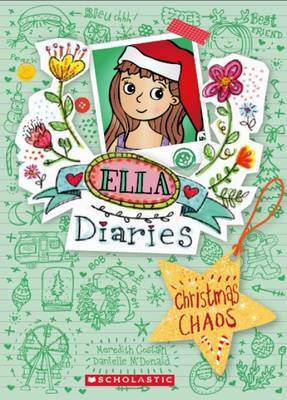 How do you plan to celebrate and what books would you like as Christmas presents? All the books! I think my friends and family are tired of me asking for books and book vouchers, but there is no such thing as too many books. 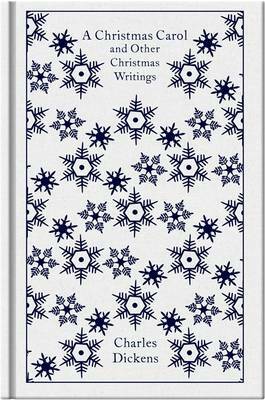 There are loads of things on my wishlist – one of the things I would really love though is the complete Obernewtyn Chronicles. My first four books are original editions with covers that don’t match the newer books – as all true book-nerds know, this is just unacceptable. At my website melissakeil.com, or on Twitter, Instagram and Facebook as MissMisch77. All the best with your books, Melissa. 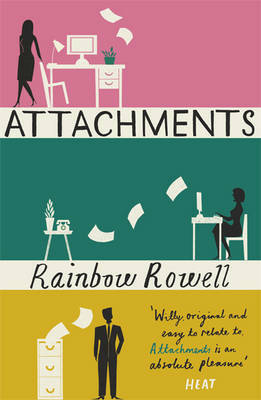 And is it just me or are Young Adult covers just getting more gorgeous every year?! 2015 showed some absolutely GORGEOUS designs. I’ll be listing my favourites below and be sure to tell me of your favourites in the comments and what you think of my picks! 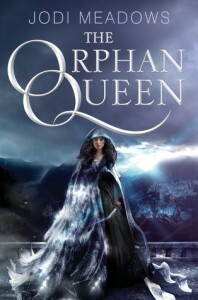 Note: All book covers link to purchase pages on this website! Click away! 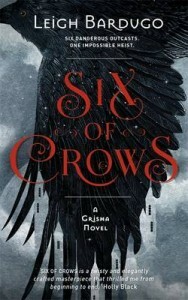 I quite adore the variety of these fantasies covers…from city illustrations, to old book vibe to crow feathers! And just look at that typography. A book that makes letters look delicious enough to eat definitely wins favour with me. Apparently stories of the Wild West were quite popular in 2015. HUZZAH. (Yes, I am Australian, but I grew up with a slight fascination of the Oregon trail.) 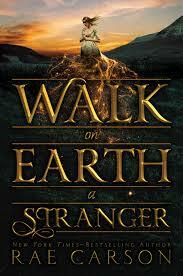 I adore Walk on Earth a Stranger for using the magic of gold dust on the cover. 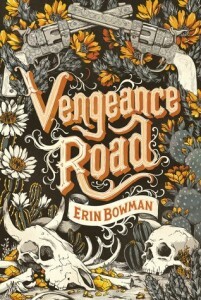 And Vengeance Road makes use of those famous wild west skulls. 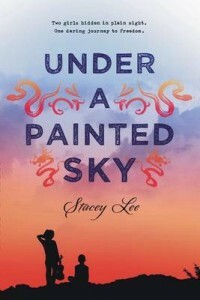 While Under a Painted Sky looks…painted?! The colours! The silhouettes! Help. 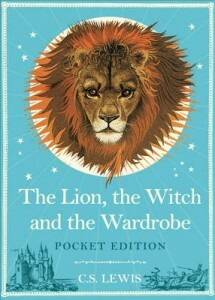 I fell in love with a book cover. 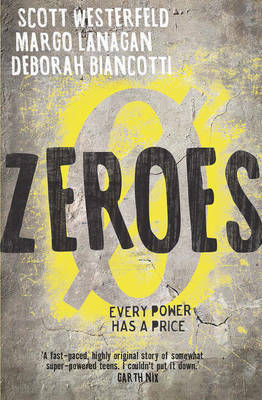 It might be just my picks of the year but…the dystopian covers seem dark this year! And they totally make use of stunning pinpoints of colour. 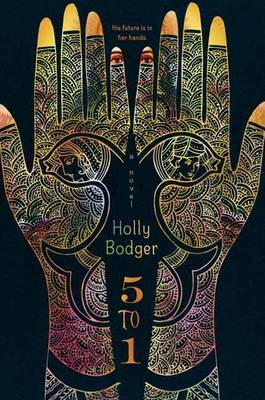 I adore how 5 to 1 has made use of Indian henna patterns to reflect the country the book is set in. Forget Tomorrow just zings with that perfect shade of blue-green. It’s like the ocean. It’s delectable. 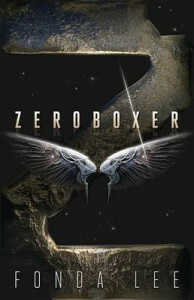 Zeroboxer just looks like it’s going to thump you in the face at any moment — and that’s what a good dystopian cover should probably do. 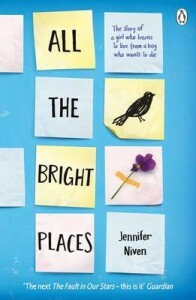 Apparently BLUE IS IN for books that deal with mental illness and disorders! Which makes sense since blue is often a colour that signifies pain and sadness. 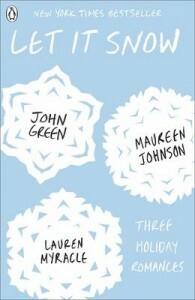 I also really like how simplistic the covers are. Basically: STARS. 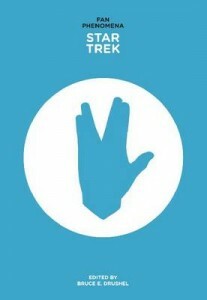 If a book has a sci-fi label, it is largely missing out if it doesn’t make use of stars and galaxies. I haven’t met a sci-fi cover I didn’t love! Historical Fiction seems very varied this year. 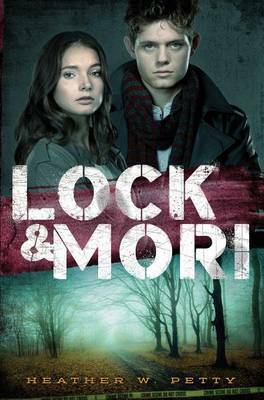 Of course these are only 3 of the many YA books published, but I do like how hands are prominently featured in the first covers. 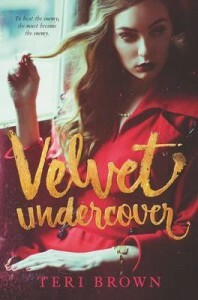 Velvet Undercover falls prey to putting faces on covers….which usually is a no-no for me. But I love the colours so much. And the typography! So it still wins! shifting perceptions of and reclaiming it (thanks to the help of some universally liked women like Emma Watson) as something positive. Which makes the release of Suffragette, the historical fiction-based film about the suffragette movement, incredibly prescient and timely. The term used then might have been suffragette instead of feminism, but this is a debate that is long-running and perennially important. As someone who’s always identified as a feminist (I successfully petitioned to get female bin girls and female altar servers back in my local municipality), there was no question I would review this film. And while I don’t know what I expected of Suffragette, but I have to admit it wasn’t the realisation that I don’t know my suffragette history as well as you’d think I would. It’s London, 1912, and the suffragette movement is gathering momentum. The voiceover contains excerpts of politicians and other powerful men debating the pros and cons of giving women the vote. Protagonist Maud Watts (Carey Mulligan), a 24-year-old laundry worker, is largely oblivious to this. 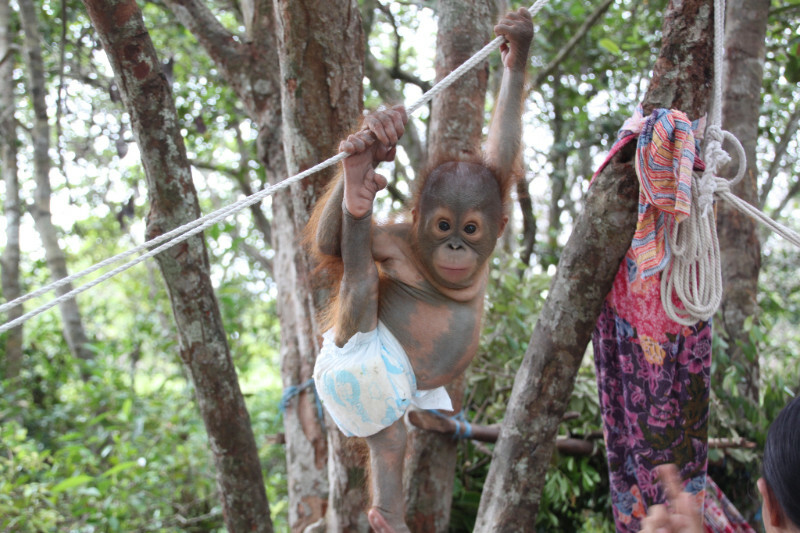 She was born in the laundry and was strapped to her mother’s back as an infant. Her poorly paid, poorly educated mother was forced to return to work as quickly as possible. Maud started working for the laundry part time when she was seven years old and full time when she was 12. Repeating the little-opportunity cycle, she now has a child of her own. Maud doesn’t identify as a suffragette—in fact, she denies it multiple times throughout the film. But trapped and dreaming of a better life, she gradually she finds herself drawn in, and eventually contributing, to the movement out of necessity. 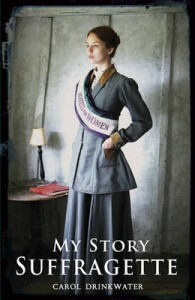 Suffragette is the story of one group of women’s experiences of the suffragette movement. Emmeline Pankhurst (played by Meryl Streep) looms large in the psyche, making brief cameos at key moments, but this film drills down to the personal. Maud, with her blistered hands, poor pay, exhausting hours, and lecherous boss is an everywoman with which we can identify. She’s supported and encouraged by a cast of incredible actors, including Helena Bonham Carter, who plays a chemist who was never allowed to become a doctor. One police officer describes her character as ‘educated with scruples’, which makes her particularly dangerous. ‘It’s deeds, not words, that’ll get us the vote’ is one of many memorable phrases this film contains. ‘You want me to respect the law, then make the law respectable’ and ‘They don’t want to be lawbreakers, they want to be lawmakers’ are other phrases bandied about as the women participate in national campaign of civil disobedience. I spent a vast portion of this film wondering what I would have done had I been alive during this time—I’m the beneficiary of these women’s courage, but I wonder how courageous I would have been. I came away with a whole new level of respect for their bravery. And an appreciation for the filmmakers who saw this film as warranting being told, which all too rarely happens with ‘women’s stories’. There was much impromptu and impassioned murmuring as the film credits rolled. Or, more specifically, a list detailing when and where women’s rights began to be recognised. For example, after years of suffragette action, women over 30 and of a certain character in the UK were finally allowed to vote as of 1918. It took until 1928 for the rest of the women in the UK to be allowed to. And it took until 1925 for the UK to recognise a mother’s right to her child. Australia was comparatively forward: women received the vote in 1902. We sat right until the end of the credits, marvelling, talking, maybe even shedding a surreptitious tear or two. It was during this time that my co-reviewer noticed two women leaving the cinema wearing suffragette hats. Something tells me they contributed to the original suffragette movement and the film held special significance for them. In light of this, and in light of the fact I’ve realised I don’t know as much about suffragette history and homage as I probably should, I’ve decided my Christmas present to me is going to be suffragette-themed books. 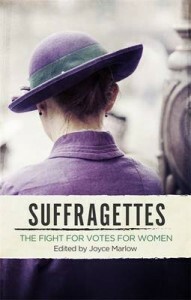 I’ll be starting with The Suffragettes: The Fight for Votes for Women and the simply titled Suffragette. If you can recommend any others—particularly seminal texts—I’m all ears. 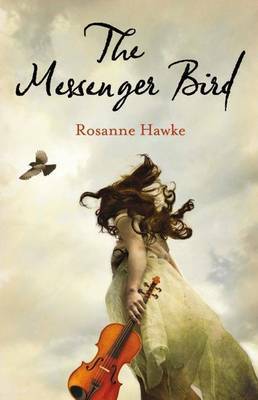 Rosanne Hawke writes hard-hitting yet compassionate novels about young people in difficult, often dire, situations. 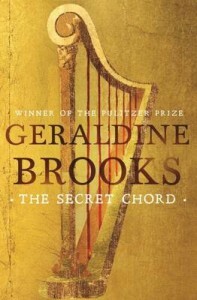 Her most recent novel for young adults is The Truth About Peacock Blue (Allen & Unwin), about a young girl accused of blasphemy. 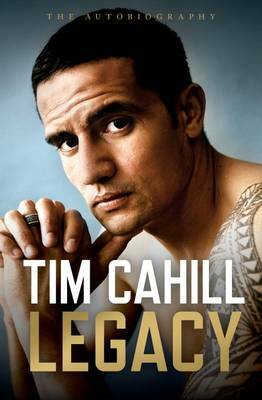 It’s an inordinately powerful and topical story, which is also well balanced. Thanks for speaking with Boomerang Books, Rosanne. I live in the mid north of South Australia near Kapunda. Besides writing I’m involved with YA & Children’s Lit by visiting schools, teaching Writing for Children and Writing for YA at Tabor Adelaide (an independent tertiary institution), by belonging to Ekidnas (SA’s Children’s and YA book creators support group) and SCWBI. Why did you live in Pakistan and what do you love about the country and its people? We lived in the Middle East for ten years and about seven of those years in Pakistan. We went as aid workers with a Christian mission agency, and I taught ESL and trained teachers to teach English in a school set up for under privileged girls in a mountain area. We lived in Khyber Puktunkhwa (formerly the NW Frontier) in a town called Abbottabad. 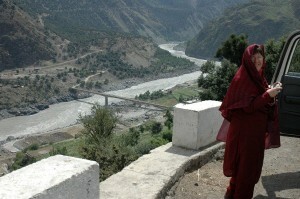 The scenery was beautiful and we took our children for their summer holidays to places like Swat, Chitral and Kaghan. The mountains are majestic and we saw snow for the first time. We found the Pakistani people to be very hospitable and family orientated. In a positive sense family members support each other and work together. Children are taught that what is best for all is best for one. Once during the Gulf War when we were confined to the school compound a poor family brought us curry they had cooked. We found that the less people had the more they shared. As someone who has lived in Pakistan and knows firsthand about people from different cultures and faiths, what do you see as a way forward to peace between peoples? Peace between people groups grows from knowledge, understanding and learning to care for each other. This occurs when we make a friend with someone from a culture different from our own. As soon as we become friends (i.e. know them, their fears, sorrows and joys) it is impossible to think of that person as ‘other’ or to demonise them. My daughter Lenore says it all starts with a smile. I suggest that people who are frightened of certain refugee groups do not have a friend from that group. Another thing I have noticed is that people who are secure in their own identity and culture are able to embrace other different identities and cultures. 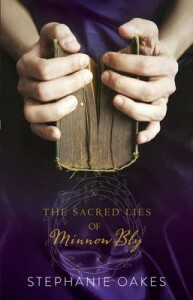 What inspired you to write The Truth About Peacock Blue? I wrote The Truth about Peacock Blue (TTAPB) because of a news article I read online about a fourteen-year-old girl accused of blasphemy. Also I had been following the story of Asia Bibi, a mother of five accused of blasphemy and on death row in Pakistan. 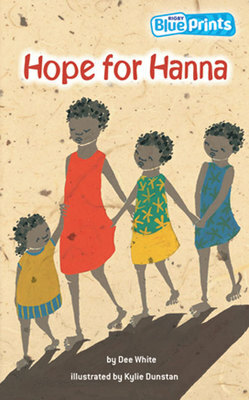 First I wrote a short story called ‘Only a School Girl’ for the UNICEF anthology, Reaching Out: Stories of Hope edited by Mariah Kennedy (2013). This was Aster’s story and the agent/publisher suggested I write it as a novel. The main character, Aster likes peacocks and peacock blue is her favourite colour so she used this as her Facebook profile name instead of her real name. The main character, Aster, has a new teacher who seems to hate her. Where does this hatred come from? By the end Aster does feel the teacher hated her. In reality the teacher is so intent on converting Aster that she loses focus of Aster as a person. A loving person wouldn’t try to coerce another to convert. The teacher’s brother put pressure on her also. Plus she has a belief that anyone who is not Muslim is kafir (a pagan or unbeliever ) and needs to change. What are Aster’s links with Australia? 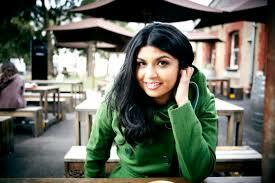 Aster has a cousin in Adelaide called Maryam Yusef who is in first year uni. Maryam sets up a blog and petition to help Aster. 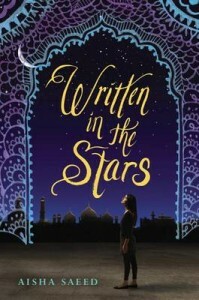 This is an integral part of the story as Aster doesn’t know that the world is interested in her, but Maryam tells the world about Peacock Blue. We also hear what a lot of people think about freedom of speech and religion, and human rights. 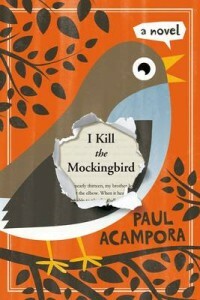 What is the importance of To Kill a Mockingbird in the novel? This is Aster’s English text. 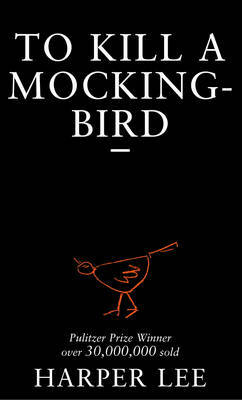 The English teacher chose it because as a work of art it did more to change racist views in America than any other book. 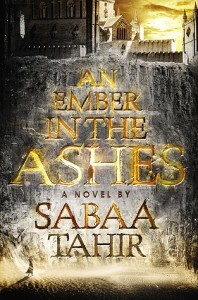 The novel has similar events to Aster’s story and it is a novel/movie most readers would be familiar with. 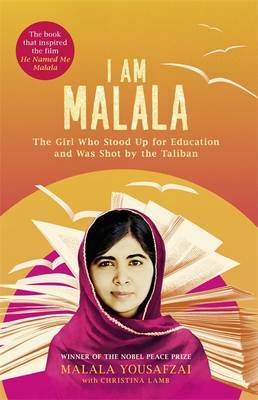 How have you linked Malala’s story into the book? I think Malala is a hero. In TTAPB a guard wanted to demoralise Aster by showing her an article of Malala being shot by the Taliban etc. But it did the opposite for Aster: Malala inspired her. After reading about Malala, Aster grew stronger, made a calendar and decided to keep hoping. 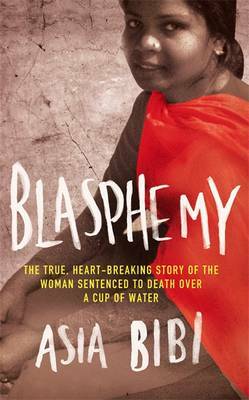 Aster is a Christian girl who is imprisoned for blasphemy (along with Muslims and others) in line with Pakistan’s blasphemy laws. What do we need to know about the plight of Christians and other minority groups in countries like Pakistan and Syria? Why is this happening, why don’t we hear about it in the news and how can we help? At the moment Christians are the most persecuted religion. At one time it was Muslims or Hindus; mostly it has been Jews (thinking of WW2). The journalist in TTAPB likens extremists, who have closed minds, to the Klu Klux Klan, a group who believed in white supremacy, and who took steps to remove non-whites from their communities. Some extremist groups will remove people they see as sub-people because they are not Muslim. The Christians had a period in history called the inquisition which acted in a similar way, fueled by power and corruption. I’m sure most Christians were horrified by the inquisition as most Muslims are today by extremists groups who use violence. Our own indigenous people were persecuted too. We can help persecuted religious minorities through groups such as Open Doors, Barnabas Fund. Agencies like World Vision are also helping minority groups during their humanitarian work. Amnesty also keeps an eye on such issues as well as human rights injustices. Why don’t we hear about it? We heard about Paris. And we heard about the twin towers. But many more are killed in Africa and other places that we don’t hear about because they are not ‘western’ and the media may not feel we’ll be interested, and so won’t run the story. Maybe there are no journalists where some atrocities happen. Some governments may ban journalists so they can run their country without interference. SBS tries to give a balanced view of world news. Groups like Barnabas give online updates on persecuted minorities. 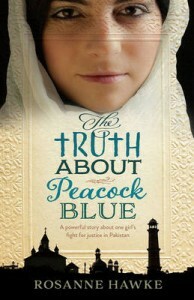 As well as child imprisonment, The Truth About Peacock Blue also challenges the imprisonment of asylum seeker children in Australia. How do you or your characters think this could be resolved? I was appalled when I returned to Australia from Pakistan and found children in detention centres. I didn’t see Pakistan doing that to asylum seekers. It’s why I wrote Soraya the Storyteller to try to make sense of it for myself. 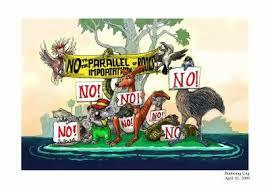 Again the way to resolve it is by making friends. I have met intelligent and nice people who say negative things about a cultural group and I believe it is born of fear. In TTAPB Maryam believes children shouldn’t be in detention, and families should be housed in communities until they can be assessed. Assessment shouldn’t take four or five years as it did with a family I met in a detention centre. They need assessors who understand certain cultural groups. 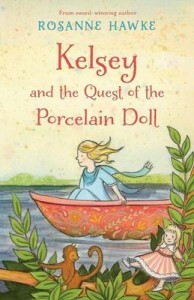 TTAPB is my 24th book and I have written picture books, junior novels and other YA novels. 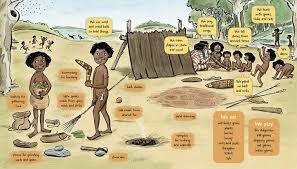 Kerenza: A New Australian is about a Cornish immigrant family settling in the Mallee farmlands in 1911. 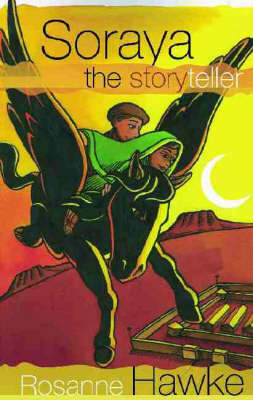 Mustara is about a boy Taj and his camel, released this week in Paperback. The Keeper series are three adventurous and thrilling books about Joel Billings who lives by the sea on Yorke Peninsula. Shahana; Through My Eyes shows orphans living in a war zone in Kashmir. 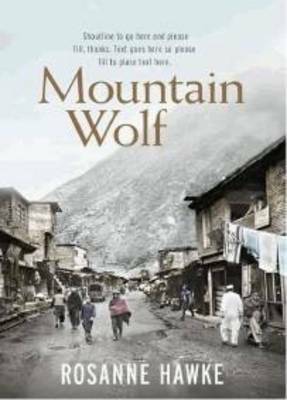 Marrying Ameera and Mountain Wolf (15 plus) deal with forced marriage and trafficking. What awards have your books won? This year I won the Nance Donkin award for my work. Last year my YA novel about grief with Cornish themes, The Messenger Bird, won the Cornish Holyer an Gof award for YA literature and the inaugural Ann Trevenen Jenkin Cup. 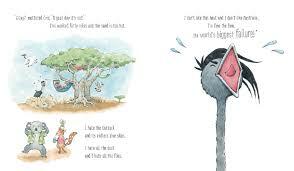 In 2012 Taj and the Great Camel Trek won the Adelaide Festival Award for Children’s Literature. My younger readers’ fantasy, Across the Creek, won the Holyer an Gof award for children’s literature in 2005. Others have been shortlisted, commended or Notable. I am working on an historical fantasy set during seventeenth century Moghul India which is now northern Pakistan. 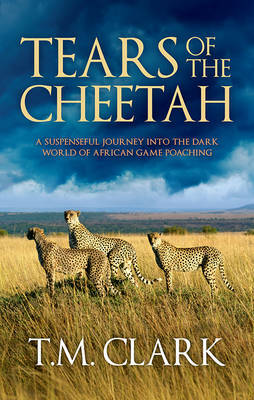 It will be released as two books: Daughter of Nomads and The Leopard Princess in June & October 2016. 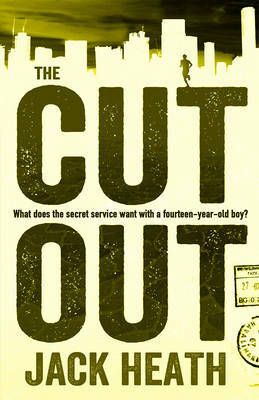 It is something quite different for me, a breakout novel, UQP says. Next year I’m writing a companion to Kelsey with a male protagonist for 2017, and my YA Borderland series will be released during 2016-2017 as four totally rewritten and re-titled separate novels (including a new work) by Rhiza Press. I’ve enjoyed many books this year; these are some of the children’s titles. This year our family will all gather at my brother and sister-in-law’s new house and garden in the mid-north of SA. I’d like my own copy of My Gallipoli and The Eye of the Sheep by Sofie Laguna, something magical or mythical with beautiful writing and engaging plot. 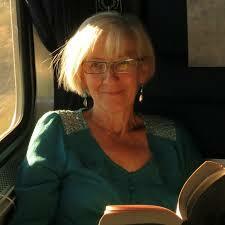 Thanks for your thoughtful answers and all the best with your books, Rosanne. PS Who Stole Santa’s Mail? doesn’t set out to change the world but it does reinforce the magic of believing in all things Christmassy (insert cheeky wink). 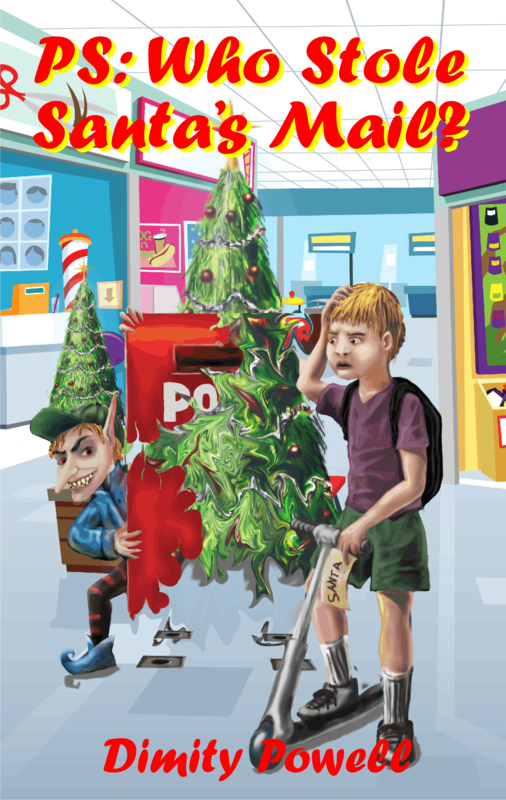 This action saturated little tale has all the ingredients of a tantalising Christmas mystery, if I do say so myself with sleigh loads of magical mayhem, weird smells, disappearing mail and an evil elf thrown in for good measure. Terrific fun for primary schoolers, by me! A Boy Called Christmas by the ineffable Matt Haig with illustrations by Chris Mould however may just save the world or at least the spirit of Christmas. 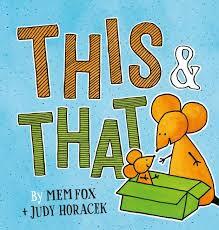 Miika is a mouse who believes in cheese despite the fact he has never seen it. Isn’t that something? 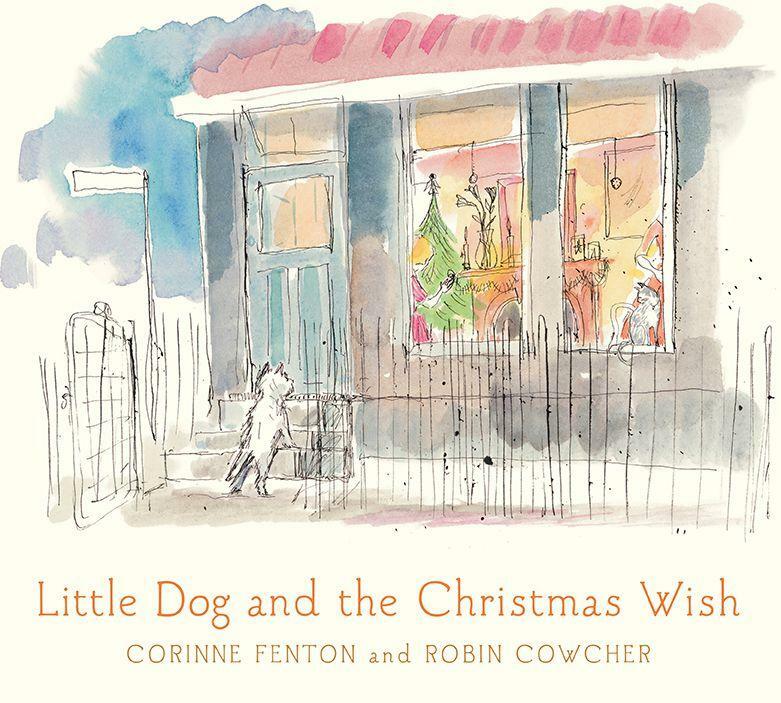 He is just one of the several seriously delectable characters in this enchanting Christmas-flavoured book. A Boy Called Christmas combines everything you thought you kn ew about Santa, mixes it with all the hopes you’ve ever had about Christmas and pats it altogether with facts you’d never dreamed about before. If there is one book you read to your children (or pets or grandparents or self) this holiday season, make sure it’s this one. Touted as an ‘evergreen, immortal Christmas classic’ A Boy Called Christmas will fill your heart with more warmth and wonderment than a jug of eggnog. Perhaps enjoy both together, at the same time. You can’t go wrong. I love everything about this book; the joy, the spirit, the illustrations right down to the sparkly snowy bits on the cover. Higher than highly recommended. 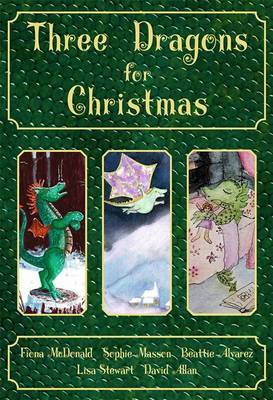 The Nights Before Christmas – 24 Classic Stories to Share is a pictorial advent-styled collection of short stories, poems, classic tales, and carols by the likes of The Brothers Grimm, Mark Twain, Hans Christian Anderson and more while, Tony Ross is responsible for page after page of vivid festive illustrations. Overflowing with merriment, sentiment, and fairies, there are plenty of fairies; this compilation is the penultimate way to countdown to Christmas sans sugar! I shared it with my nine-year-old last year and now we are giving it a second airing. She will not abide missing a day’s story or skipping ahead. The lure of what awaits for the next night is half the attraction. A bit like waiting for the man in red himself. Very very special. 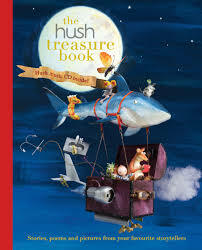 Another unreal collection and Christmas keepsake is The Hush Treasure Book. Readers can meander in and out of the stories, poems, and pictures of some of Australia’s most well-known and best-loved authors and illustrators whilst listening to the melodic tones of the accompanying CD. The picture book format of this assorted box of literary treasures renders it a collector’s must-have while making it utterly wonderful to share with your children. You can read Joy Lawn’s illuminating review of Hush, here. She made it through Judith Rossell’s incredible Maze Page contained within as did my ten-year-old. Not surprisingly, I did not. I am not a fan of mazes, but I am in love with this book. 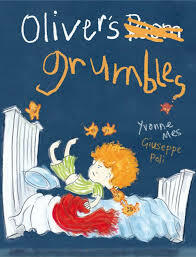 It doesn’t really matter where the exact origins of the term ‘emo’ originated, what matters is this spanking new picture book by Tony Wilson and Lucia Masciullo. 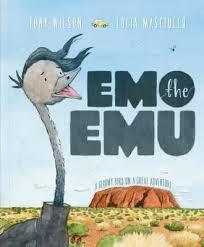 Both creators have captured the essence of emo in this picture book adventure, Emo the Emu. Emo is one moody, despondent little emu dude so full of mope that he is unable to enjoy his inner emu and Old Humpty Doo where he resides with his extended flightless family. Wilson’s lilting rhyming verse personifies the creatures of our Aussie landscapes precisely while focusing on Emo’s utter gloom. Masciullo’s watercolour illustrations are ridiculously true to country and fun. Her rendition of lanky-fringed, angst-ridden Emo is hilariously spot-on (worthy of eliciting dozens of teenage eye-rolls). Thankfully, cool Kanga Katie lightens the mood and saves Emo from himself. This will make an awesome gift-with-a-difference for overseas family and friends or for those with a hankering to see more of our great land. A beaut exploration of friendship, emotions, travel, and the great Aussie outdoors. Put it on your list! Need an extra dollop of Oz? Look no further than Australians, Let Us Barbecue! 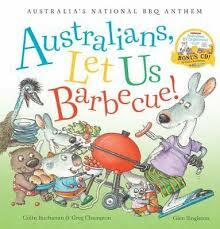 Yes, Colin Buchanan and Greg Champion along with the iconic illustrations of, Glen Singleton have merged every bit of Aussie swank and summer backyard tradition into the tune of our Australian National Anthem, (one I am betting Aussie kids will instantly learn the words to!) I am throwing both thongs in the air for this one. Slap the accompanying CD on for a rousing recital and sing-along to the very recognisable soundtrack. It’s not just all about burnt black snags on the barbie. The lads take us across rugged mountain ranges, across scorching desert plains, around the Rock, through the Whitsundays and back again. 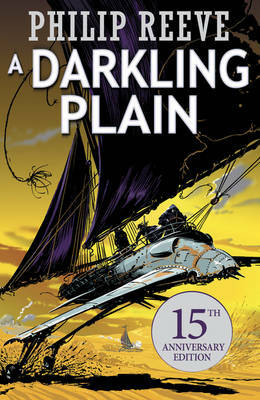 I am almost on that sailboat and in that Kombi thanks to Singleton’s dynamite depictions. An exemplary example of an Aussie summertime that must be experienced by everyone. Quintessentially, unashamedly Aussie. Oh there are stacks more, but investigate these first, then have a look through the Boomerang Kids Reading Guide 2015 / 2016 for more great gift ideas. You will not be disappointed. 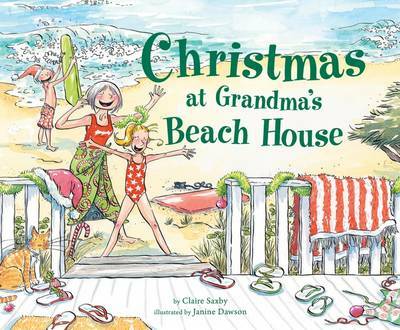 Need more Christmas-themed books to keep your little ones entertained this season? 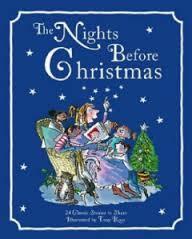 Between my previous list, those featured on the Kids’ Reading Guide, and the Boomerang Bloggers fantastic suggestions, you won’t be short for choice of top quality reads to cover all your festive needs. 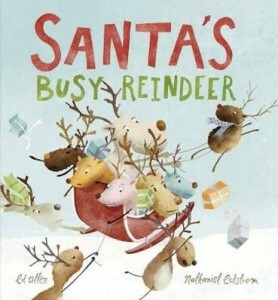 Santa’s Busy Reindeer, Ed Allen (author), Nathaniel Eckstrom (illus. ), Scholastic Australia, 2014. In a similar style to some of his other titles including 10 Cheeky Possums and 10 Funny Sheep, Ed Allen teams up with illustrator Nathaniel Eckstrom to sing us a reindeer tune just like the 10 Green Bottles one. Readers journey with ten fun-loving, and at times obstinate reindeers, with each page turn subtracting one poor deer from the equation. Carrying out all their favourite Christmas pastimes, like ice skating, hanging fairy lights, organising gifts, carolling, baking and decorating the tree, unfortunate (but oh-so-humorous) mishaps lead us down to one, until they all regroup with Santa’s call and they’re off on their merry way. Bursting with energy, cheekiness and Eckstrom’s witty illustrations, it’s so much fun to see the reindeers’ attempts at productivity the night before Christmas! Santa’s Busy Reindeer will have your preschoolers in fits of giggles and lots of sing-along action. 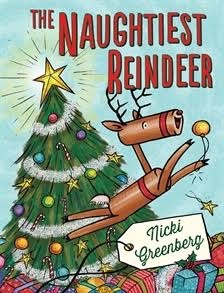 The Naughtiest Reindeer, Nicki Greenberg (author, illus. ), Allen & Unwin, 2013. Poor Rudolf is bed-ridden on the night before Christmas. How will the other reindeer manage to pull the sleigh without him? Never fear! Ruby is here! But Ruby isn’t exactly the most obedient of reindeers. Her over-enthusiasm and impetuous nature lead her to all sorts of mischief. Too much for Santa to bear, he heads back to his Mrs, mistakingly dismissing one visited home, and Ruby! How will those children react when they discover their absent presents? Who will make up for the night-time disasters? You will see, a little compassion goes a long way! 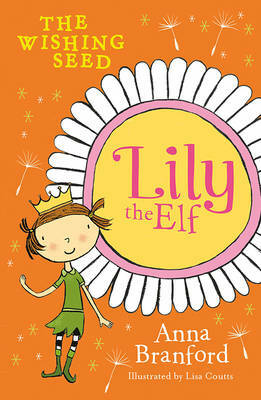 You’ll be lolloping along with Ruby’s antics in this gorgeously comical and engaging rhyming story. Young readers will fall in love with this delightful and zealous character, and no doubt will relish the sequel out this Christmas, The Naughtiest Reindeer at the Zoo. 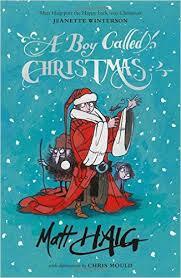 There is a Monster Under My Christmas Tree Who Farts, Tim Miller (author), Matt Stanton (illus. 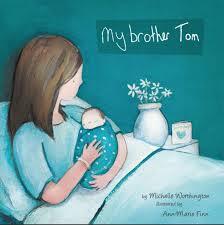 ), ABC Books, 2014. From naughty reindeer to naughty monster. This one’s exploding with naughtiness and cheek! 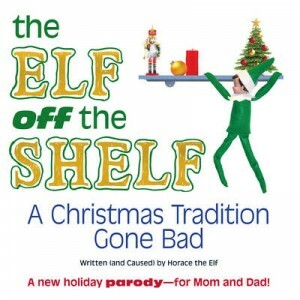 With foul language and foul smells, a young boy’s Christmas is ruined by the gaseous fumes that pervade his every move. As told in first person in an explanatory style, we learn how the wrapping of presents ritual is infused with bauble bombs, a photo with Santa captures nothing but cloudiness, and Mum and Dad can’t get past his cracking noises and putrid whiffs. But will Santa believe the young boy’s innocence, or will the monster’s true identity be revealed at just the right moment? If you’re into toilet humour, you’ll love it! There is a Monster Under my Christmas Tree who Farts, with its animated, digital cartoons, is certainly not a ‘pleasant’ read, but early primary children will certainly be tooting for more. A.J. 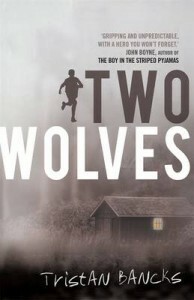 Betts has achieved great popular and critical acclaim for her YA novel Zac & Mia (Text Publishing). Why A.J. rather than Amanda? 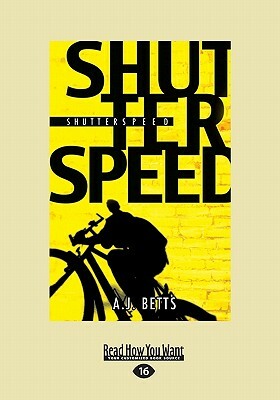 I chose to use my initials for the publication of my first novel, Shutterspeed, which was, amongst other things, a book written to appeal to reluctant male readers (14+). After teaching teens for many years, I realised how little was written to engage and excite this group. I worried that a female name on the cover might give potential readers a reason – however small – not to pick up the book. My decision was also a homage, of sorts, to S.E. Hinton, and her amazing work and legacy. After growing up in Far North Queensland, then living for a time in Brisbane and overseas, I’m now based in Perth, where I’ve been since 2004. I’m fortunate to live beside the ocean. I’m obsessed with the blues. I’m quite involved in the YA scene. I’m a member of WA branch of SCBWI (Society for Children’s Book Writers and Illustrators), which regularly meets for workshops and talks. I’ve made some incredible, like-minded friends through this organisation. 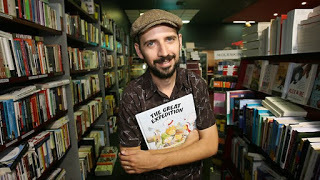 I spend a lot of time speaking at schools and festivals, including working with The Literature Centre in Fremantle, which promotes Australian children’s creators, and conducts writing programs for young people. More generally, I’m a proud supporter of the LoveOzYA campaign, as well as the Room2Read projects. Besides writing and presenting, I teach high school English part-time. I’m a keen cyclist (I own five bikes) so I try to get out most days, followed by an ocean dip. I read when I can, for pleasure or research. If I need some ‘down-time’ I watch films or I wander around shopping centres like a zombie. 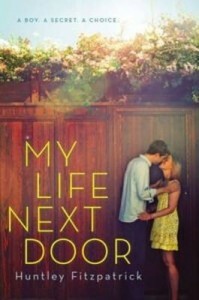 What inspired you to write Zac & Mia (which I reviewed for The Weekend Australian here)? For the past eleven years I’ve worked as a high school teacher in a children’s hospital in Perth, and most of that time has been spent working on the cancer ward. Even so, Zac & Mia was a surprise to me. In the past, my writing has always been sparked from random moments, followed by ‘what if?’ questioning. I never imagined I’d write about topics so close to my real (working) life. I never thought I’d write a novel so emotionally testing. 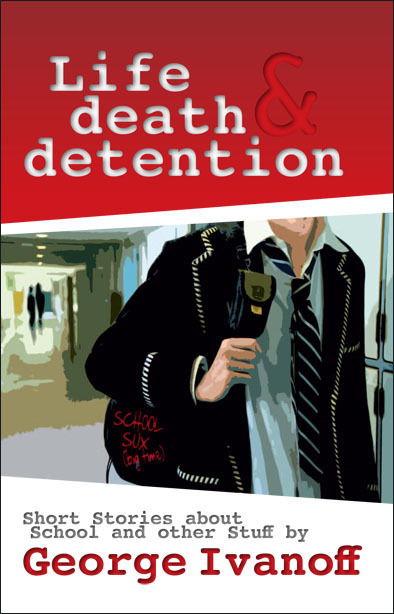 The book came about from two separate things: firstly, my empathy for teenagers stuck in isolation during a bone marrow transplant treatment (imagine being stuck in a room for five weeks!? ); and secondly, because of a request I had from a cancer patient who wanted me to write a romance. I didn’t know which idea to pursue first – isolation or romance – so I wondered if it was possible to bring the two ideas together. This raised the question: is it possible to fall in love with someone you can’t meet? Cancer wasn’t a driving ‘theme’, but the catalyst for bringing the two characters together. As the story developed, so too did the ideas, such as finding ‘a new normal’ after illness or change. It was only in the editing process that I realized what is truly at the heart of the story: What is beauty? What is courage? What is love? The characters are working out their own answers to these questions – and I certainly learned a lot from them along the way! I’m indebted to the hundreds of teenagers I’ve worked with on the cancer ward – they are the reason I persevered with this book, honestly and earnestly. They continue to inspire and surprise me. 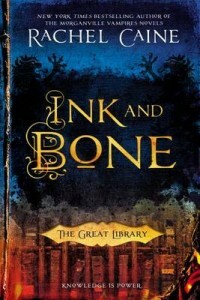 Could you tell us something about your main characters, and also about the book’s structure (which I love)? The entrance of Mia’s character, on the other hand, needed to prompt contrast and conflict, and as a result she’s more impulsive, self-focused, and quicker to anger. She’s feisty! Whereas Zac’s decisions are based on logic, hers are emotion-fuelled. She was also fun to create, but it took me a long time to get her character right. Again, she’s made up of teenagers I’ve known (their comments; not necessarily their actions) and parts of me. I had to delve into my teenage recollections to truly bring her to life. The three-part structure – Zac’s perspective; alternating perspectives; Mia’s perspective – evolved through the writing process. Originally, the novel was going to be completely narrated by Zac, but when I was approximately eight chapters in, I realized the main character arc was going to be Mia’s. This meant I needed to give her the chance to reveal much more of her inner life. 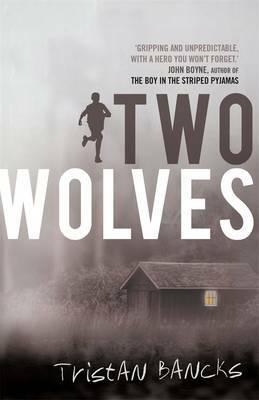 I liked the alternating chapters in the middle third, as it contrasts the characters’ experiences while showing their lives intersecting. 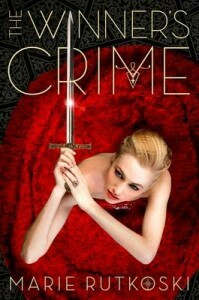 By devoting the final third to Mia, I came to like her more – and hopefully the reader does too! 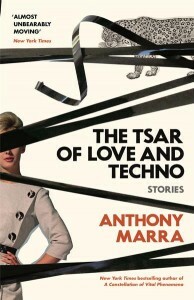 The novel’s three-word title came directly from its three-part structure. 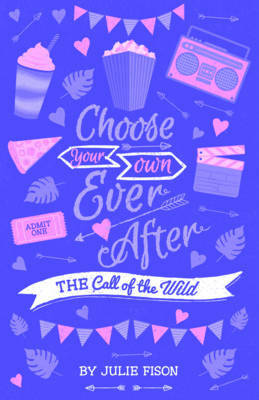 Have you received any responses from young readers about Zac and Mia that particularly resonate with you? I’m overwhelmed by the sincerity of the emails I receive from young readers, both here in Australia and overseas. Some have cancer; some have witnessed it in a friend or relative. For most readers, though, they really relate to Mia’s experience, which is not about illness but universal experiences such as hope, rejection, fear, self-loathing, love, vulnerability and frustration. 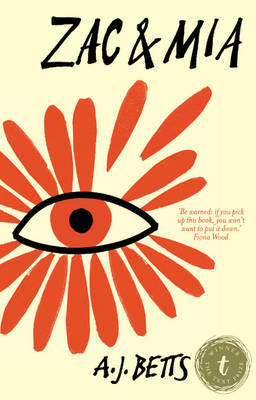 Readers tell me the book moved them, and that they see their worlds with new eyes. What a privilege this is, for me. 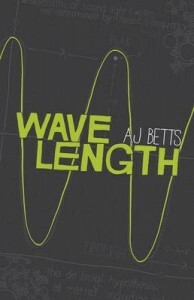 My first novel is Shutterspeed (Fremantle Press; 2008), followed by Wavelength (Fremantle Press; 2010). They are completely different from each other, and from Zac & Mia. Shutterspeed is fast and edgy, exploring ideas of obsession and secrecy. 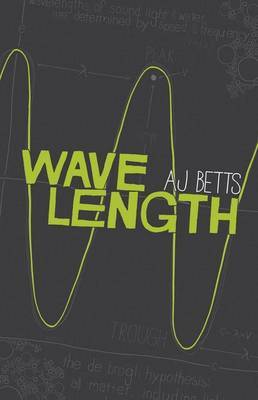 Wavelength is more funny and philosophical, reflecting on the decisions that teenagers (nearing the end of Year 12) need to make. My current project is already three years in the making. 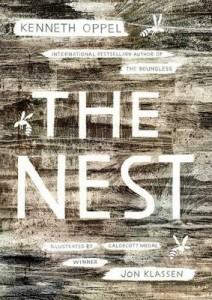 It’s something unexpected and exciting – a work of speculative fiction set in a future Tasmania. It’s my most adventurous story yet. I’m about 2/3 through the draft, though the overall shape keeps changing and I’m continually having to rework earlier chapters. It could be really good or a terrible mess. I’m yet to find out! But I’m enjoying it right now, which must count for something. So much! I’ve just finished reading Illuminae (by Amie Kaufman and Jay Kristoff) which kept me awake at night for all the best reasons. 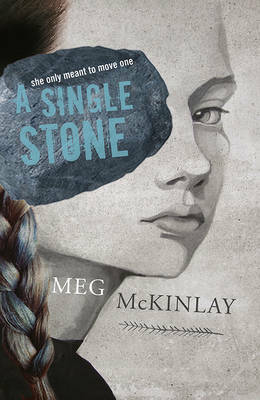 This year some of my favourites have been Station Eleven (Emily St. John Mandel), My Brilliant Friend (Elena Ferrante), The Night Circus (Erin Morgenstern), South of Darkness (John Marsden), A Single Stone (Meg McKinlay), and Inbetween Days (Vikki Wakefield). I’m about to begin reading American Gods (Neil Gaiman), and a non-fiction book called The Soul of an Octopus (Sy Montgomery). I can’t wait to begin. Already!? This Christmas will be a quiet-ish one in Perth with good friends, good food, and some cooling ocean swims. For Christmas, I need another bookcase, and only then I’m allowed to buy/receive new books. No-one dares buy me books for Christmas as they know how fussy I am. For the New Year I’ll be going to New Zealand for a one month cycle-touring trip of the South Island, (with some research and bookstore events/visits thrown in). Travel, bikes, books – what more could anyone want? 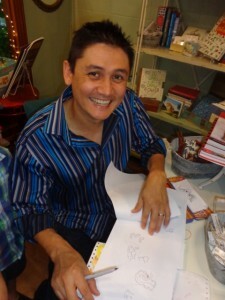 Congratulations on the launch of your latest picture book release, ‘Adelaide’s Secret World’! Your recent exhibition displayed a stunning collection of your oil paintings from the story. Please tell us about the response you’ve received and the most rewarding part of the whole process. It was really special to have the book wrap around me in the gallery, and for people to be able to read it as they moved around the walls. By far though, the best responses have been from people being immersed in the text and telling me about their genuine connections to the character. That has been from adults and children alike. 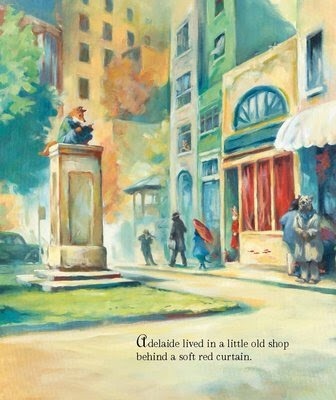 ‘Adelaide’s Secret World’ is a touching tale full of imagination, reflection, serendipitous and courageous moments that empower change and finding one’s voice. 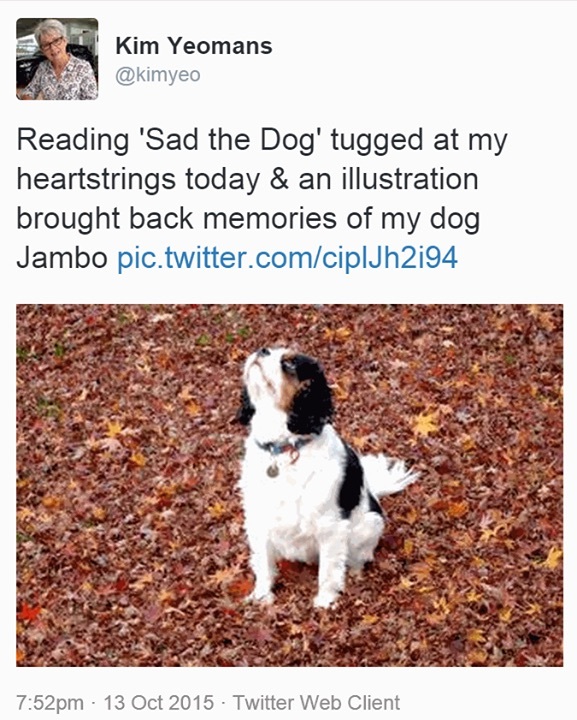 Where did the inspiration for this story come from, and how did it develop? I understand Adelaide, and I think there is a little bit of her in many of us. She is that person who has a beautiful rich world within her but no one notices. She is wrapped up in loneliness and has turned it into a safe place. She is observant and thoughtful, creative and active but she simply doesn’t know how to reach out to those around her. 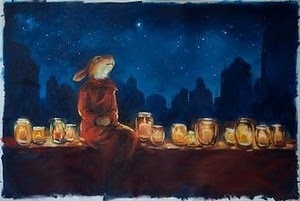 She grew from the coming together of many things – a painting of a solitary rabbit in a cafe that I created some years ago, a character of a woman striding through a street in New York with a strange huge bird, the memory of being at university before I had made new friends and how lonely that was even though I was surrounded by people. And the movie Amelie was one that struck a chord too, in dealing with a similar character. The more I thought about the character and the source of her isolation, the more she developed into a real person for me. How long did the process take from inception to completion? What were the most challenging aspects of creating ‘Adelaide’s Secret World’? Some of the earliest emails I was trading with my editors Erica Wagner and Elise Jones at A&U are from 2011 – so the story has been on the boil for some time. 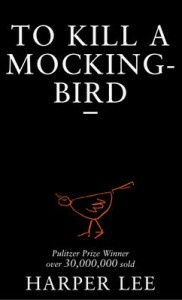 The character was still changing then and the story was quite different. Over the next 4 years we met and talked a lot about what we wanted the story to be and how to make it flow naturally. One of the challenges is to make the story reinforce itself at every turn. Picture books are short so nothing should be wasted. All of the tiny details should support the narrative and should be symbolic in some way – from the colour choices to incidental details. In an early version I had intended that Adelaide would have a red coat hanging on her wall which she wasn’t brave enough to wear until the end of the narrative. However, I changed that to have her wear a red coat throughout the story. This way she was a visual focus, but also it showed that she was the warm beating heart of the story. It was important to me that she was not seen as broken or empty, but that she had so much to give if she could just find a way to speak out. In the red coat she carried all of that imagination and warmth around with her. It was also a nice visual link to the red curtain, itself a powerful metaphor. The curtain changed from being a comfortable buffer between her outer and inner world, to being torn apart and reused as an agent of change and connection when it is pulled into a long strand. This is used to physically connect others in the community, as well as Adelaide, so that when they leave their houses in the morning they follow the red strings and meet each other for the first time. I loved creating the paintings, but it was the story that was the biggest and most important challenge. 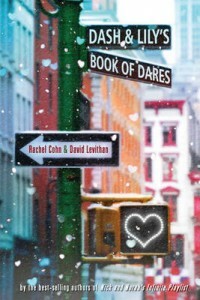 I wanted a story with real heart, not just a lot of nice pictures. Your paintings are contemporary yet reflect classic detail in their artistry. 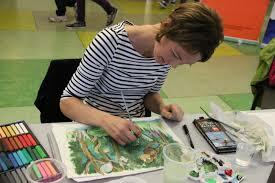 Which illustrators have been your greatest influences in becoming the successful artist you are today? 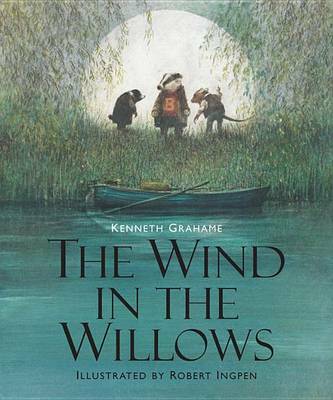 How did your path lead you to illustrate children’s books? To some extent I studied them when I was a child, but after that I think I just carried around aspects of their work in my head, just the same as you keep certain music and scenes from films and books, characters you meet and things you witness. They all swirl around together and find their own way out. I was a traditional artist first, before moving into illustration. 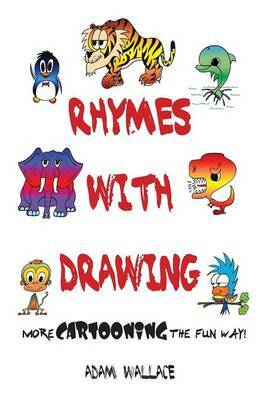 This was great for assembling the skills I will draw on for the rest of my life as an artist. What that area lacked, though, was story. 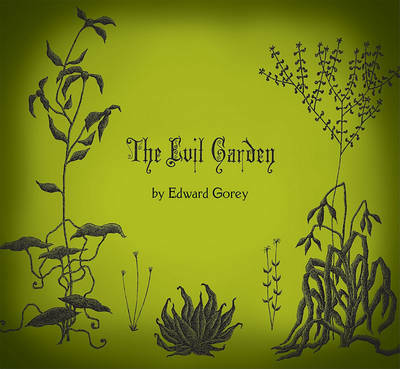 And once I began illustrating I found the other artwork I was doing to be curiously hollow. I could like it for what it had achieved but I didn’t have the same feeling and excitement for it as I do with narrative works. Your range of books showcase a variety of illustrating styles, from ink and watercolours to oil paintings, whimsical to soul-stirring. Do you have a preference over which medium you like to use? What is your process in determining which style best suits the story? I used to change all of the time because I had all of these styles and media at my disposal (because of the traditional art beginnings). Now I have my two favourite styles that I think are the best conduit for my imagination. One is highly detailed and precise drawings in black and white. The other is expressive oil painting. They are opposites, really. Oils are fast and expressive, emotional and dramatic. The drawings are slow and considered, evolving and detail-filled. They are great for expressing completely different stories and aspects of the world I love. What does your art studio look like? Meticulously organised or creative clutter? It has evolved from creative clutter to meticulously organised. I used to love being surrounded by inspirational things, but it got to a point when the functional space in my room was about a third of its actual size. It had to stop. Having kids too, there needs to be one space where I can go that is organised. What are your favourite figures / scenes to draw / paint? Why? I like to draw without an agenda and see what happens. Unplanned drawings where a character finds themself in the middle of an adventure – that’s great fun. All I need is the beginning detail and it just goes from there. My inner child often gets to star there somewhere. 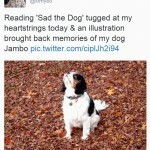 Your writing style is equally as emotive and enchanting as your pictures. How do you get this harmony so aligned? Do you prefer one aspect of the book creation over the other? I think the writing and pictures are really two hands working on the same task. They may have different things at their disposal but they are always supporting each other. I pay particular attention to the strengths of each medium at evoking the senses and helping us to make connections. So colour has an emotional language for me where cools shades might be sad or reflective, and warm ones are happy or excited or angry. Likewise I’ll describe sound or smell with the words. The more connections we make, the more immersive the experience of reading can be and the more real the story becomes. I would have to say that I write and illustrate for me. And I sincerely hope that the adults enjoy the books as much as the children. What advice would you give to aspiring writers and illustrators wanting to succeed in the children’s literature industry? I guess – become good at what you love. Keep learning, keep practising. Go to life drawing classes and get to know the human body. But above all else keep experimenting to find what it is that comes naturally to you and how you can use that strength and individuality to create things that are distinctly yours. What are you currently working on? What can all of your fans look forward to seeing from you in the near future? I am completing a few commissions, while I think about the next story. I know it and the main character but I have yet to get anything onto paper. If you have read Adelaide then you have already met him. Next, the Fox gets his story. Thank you so much, Elise! Looking forward to Fox’s adventures! Connect with Elise Hurst at her website and facebook page. Teaching notes for Adelaide’s Secret World can be found here. I adore Anna Branford’s endearing character Violet Mackerel, who features in her own series for young girls, illustrated by Sarah Davis (Walker Books). Violet is written exquisitely and her empathy and kindness moves me even on multiple readings. 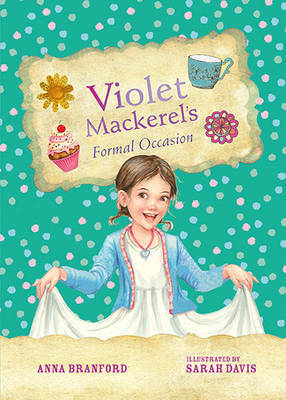 The most recent instalment is Violet Mackerel’s Formal Occasion. Thanks for speaking with Boomerang Books, Anna. Where are you based and how involved are you in the children’s lit world? I live in Melbourne in a little apartment that looks down over a park. It is just about perfect for a writer as it’s very quiet but at the same time, I can see the world going by. 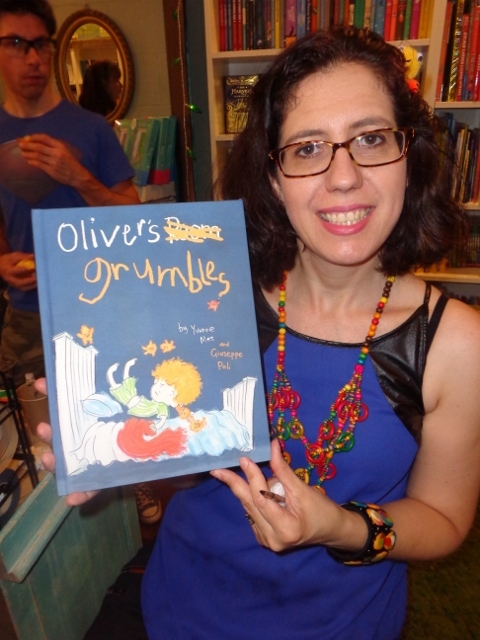 As for my involvement in the children’s lit world, besides writing, I’ve been doing lots of school visits and touring this year and I’ve also had the opportunity to present at two writers’ festivals too, Brisbane and Melbourne, both of which were fantastic. I lecture in Sociology at Victoria University, teaching on topics like childhood and religion. And I also love making things by hand, especially dolls and nests. I love knitting and felting and that kind of thing. What inspired you to write the ‘Violet Mackerel’ series? In a funny sort of way, the inspiration actually came through doll making. I was selling my dolls at an especially beautiful Melbourne country market, St Andrews, which is outdoors and starts very early in the morning. It was during the winter so it was still dark. There was a fire and some people were playing fiddles and flutes, and even though the sun was coming up there were still stars in the sky. It was a bit magical really. I noticed that some of the people setting up their own stalls had children with them still in pajamas and half asleep, watching the market forming all around them. And as I was wondering what they thought about it all, somehow Violet and her family popped into my mind. Could you tell us something about your main characters? Are the children or adults modelled on real people? One of the funny things about writing is that for me, I often don’t realise where my influences and ideas come from until after I’ve finished the story. Then, as I reread, I realise how very much like my sister Violet is, or how similar Violet’s mum’s reaction is to something I have recently felt myself. Retrospectively, I can usually see exactly where each trait and characteristic comes from, but it’s never intentional at the time of writing. I see my sister, my friends (especially young friends) and sometimes myself in the characters I write about. I love reading about Violet’s family’s creativity and involvement with making things and going to markets. Do you also like these things? I absolutely love them. I grew up with parents who often made things and who encouraged my sister and I to make things too. And for me markets, and especially craft markets, are places where you get to see newborn ideas, fresh from people’s minds and hands. I also feel a lot of love for handwork with small and slightly uneven stitches and unintended fingerprints in clay – all the evidence of the love of human hands. 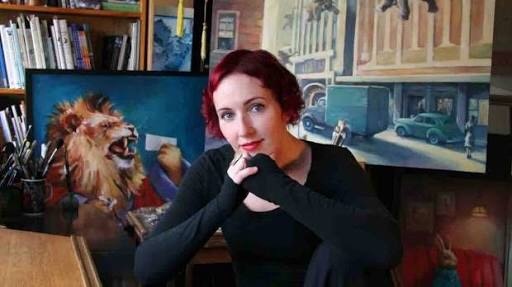 How closely have you collaborated with illustrator Sarah Davis? I love working with her. In some ways you could say we collaborate closely in that we are absolutely co-creators of Violet and her family. But at the same time, many of the ideas in the Violet stories come purely from Sarah and are a wonderful surprise for me when I first open a set of illustrations for a new Violet story. Lots of the humour especially! 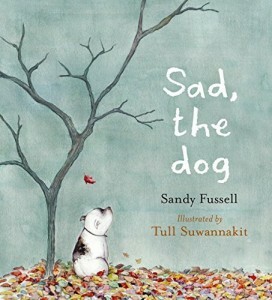 In the later books in the series, Violet’s teddy bear has become a hilarious side character in the stories, reflecting Violet’s emotions and thoughts. That is purely Sarah’s doing and I enjoy it as much as any reader of the series! Why is a different illustrator used in overseas editions? Violet has actually had four different illustrators in her different editions! I believe that is pretty unusual and I’m not sure of the reasons behind the choices publishers make about these things, but my best guess is that an ‘ordinary family’ like the Mackerels is actually quite a specific idea depending on the culture and society it is being portrayed for. It has been hugely interesting for me to see both the differences and the similarities in the way the characters have been created in their various incarnations. 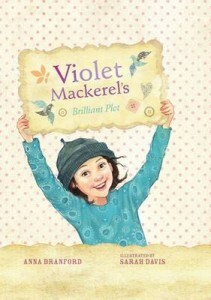 Have you received any responses from young readers about Violet Mackerel that particularly resonate with you? One thing I would never have guessed when I started out as a writer is the wonderful mail you begin to get! I’ve received beautiful handmade gifts from children and lovely stories from parents telling me that a Violet book was the first their child read independently from cover to cover. That just amazes me. 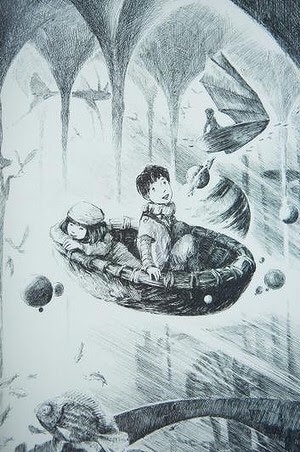 I’ve heard from a few young readers that they think of Violet as their own friend, and that resonates with me a lot. When I was young my family moved very often and I always has to leave friends behind, so I know how important portable book friends can be for children. Just recently I have been working on my new series about Lily the Elf. Lily lives with her dad and her granny in an elf house under a bridge, with a moss garden and a huge (to her) dandelion overhead. So she is an urban sort of elf who exists, as lots of us do, in the city but also in an incorporated natural world. 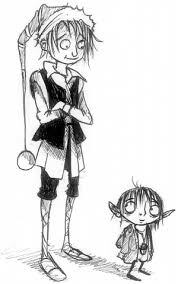 And although there is a lot about her life that is elf-specific, such as her tininess, she is a relatable character too, and deals with lots of the same troubles and delights that children her age do. 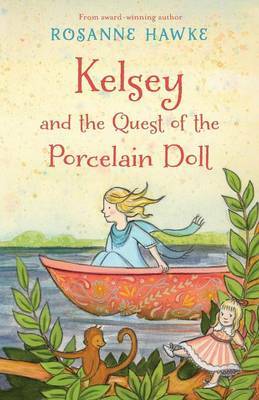 I’m having a lot of fun creating this series in collaboration with Lisa Coutts, an illustrator who captures Lily’s world so beautifully that I secretly suspect she may be half-elf herself. 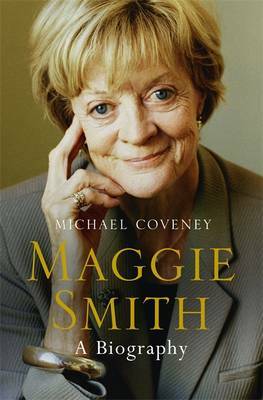 What awards have your books won or been shortlisted for? I’ve been very lucky in this department over the past few years! Violet Mackerel’s Brilliant Plot was Honour Book in the 2011 Children’s Book Council of Australia Book of the Year Awards, Younger Readers category. 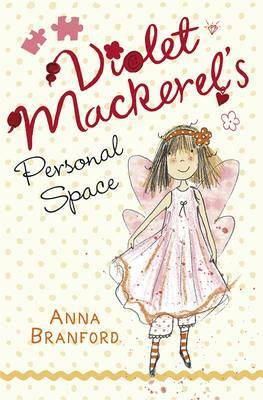 In 2013, Violet Mackerel’s Personal Space won the Young Readers/Picture Book Award category of the Australian Family Therapists’ Award and was short-listed for the 2013 Children’s Peace Literature Awards. 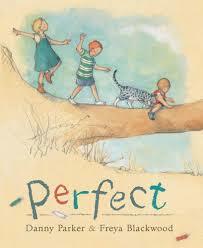 And in 2014, Violet Mackerel’s Possible Friend was short-listed for the CBCA Book of the Year Awards, Younger Readers category. I’m working on two things at the moment, a new Lily the Elf story about the trickiness of parting with old things even though you don’t really need them any more. And another thing that is top secret! My favourite book of all time is Wind in the Willows by Kenneth Grahame. I read it when I’m feeling sad and it is like an old friend. I read it when I get sick and it makes me feel better. 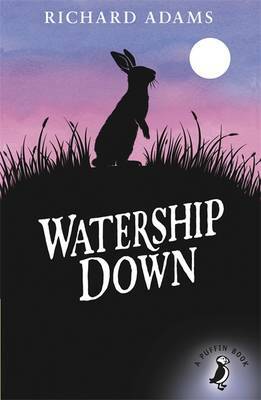 I read it at Christmas and it fills the time with magic. I think there will always be at least a bit of happiness with me all my life, so long as I always have a copy on my shelves. 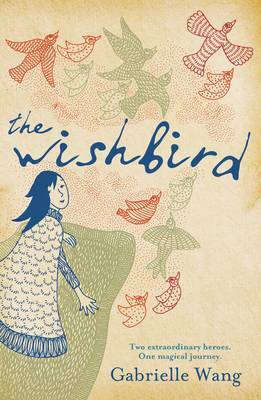 More recently I have been some of Banana Yoshimoto’s books and enjoying them very much and wishing I could travel to see some of the places she is writing about. I absolutely love Christmas! This morning my sister, my mum and I are also taking my three-year-old niece to ride the Christmas train at Myer and to see a gingerbread village. In the afternoon I am going to choose myself a Christmas tree. I celebrate non-stop all through December. I can never sing enough carols, or see enough lights and gingerbread creations, or wrap enough presents or light enough candles! But for Christmas itself my partner and I will disappear up into the mountains and have a couple of very peaceful days together, which is one of my favourite things of all. 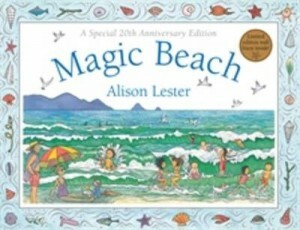 This year I would love to start sharing Alison Lester’s beautiful books with my niece so I am hoping for a copy of Magic Beach. Where can people find you and Violet on social media? I have a website, annabranford.com, and can also be found on facebook. All the best with your books, Anna. I’m looking forward to spending more time with Violet and Lily and later discovering your top secret project. Highly talented artist, Elise Hurst‘s illustrations seem to metamorphose with every title, from fluid watercolours to fine ink lines and bold, sweeping strokes of oil colours. In this latter artistic style, differing to that of some of her other titles, including My Boots in Season and Imagine a City, Elise Hurst has produced an intriguing, heart-stopping new book, its words and pictures working together to take your breath away; it’s Adelaide’s Secret World. She lives a solitary existence. A life once full of delight and wonders, now, a world confined in glass jars, hidden within a cloak and a red curtain. The town in which Adelaide lives is bustling with movement, but it seems the townsfolk are simply, and privately, just passing through each day. Longing for a connection, a serendipitous moment finds Adelaide at the door that opens her heart and soul to a whole new world full of possibilities. As she finds her inner calm, it is that very red curtain that once blocked her vision that she courageously uses as the missing link. By connecting the torn thread amongst the townsfolk, those who were once lonely and silent, including Adelaide, have now found a voice, and each other. 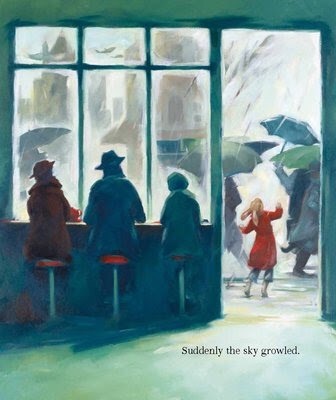 With her stunning collection of dreamy oil paintings and evocative words, Elise Hurst takes her readers on a soul-searching journey that touches a little piece of all of us. Feeling lost and isolated is not uncommon, particularly in a world of chaos. But Adelaide reminds us that friendship, humanity and self expression can always be found, and celebrated with a little bit of courage and an open heart. 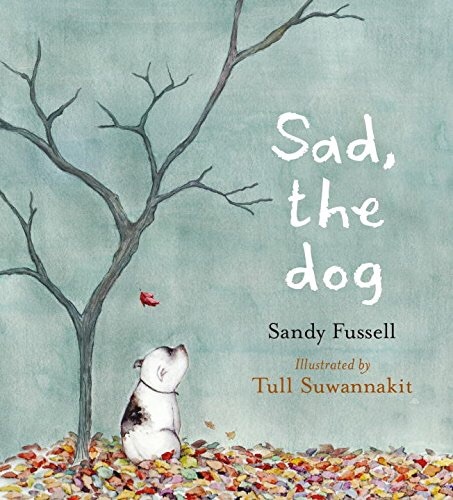 The exquisite mixture of colour, movement, emotion, and poetic softness in both text and illustrations work flawlessly together to evoke feelings of angst, peace, turmoil and calm. Pale yellows and greens in the beginning and end shed light on a world that is safe and comfortable, and becomes brighter even more so as Adelaide’s world is suddenly flooded with energy and an inner peace. 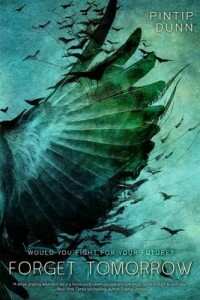 The mid-section carries deep greens, blues and greys, signifying this spinning, chaotic whirlwind inside her mind. 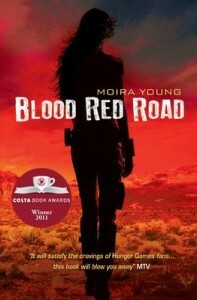 And throughout the book, pops of red burst with visual warmth, power and imagination. 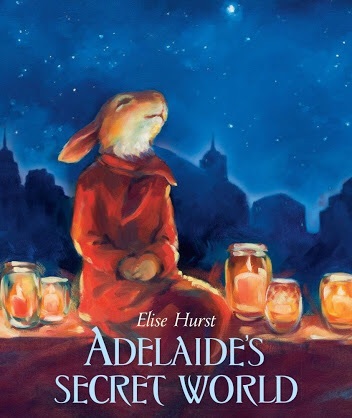 ‘Adelaide’s Secret World’ is undeniably uplifting and visually rousing, a perfect choice for early primary children to revisit over and over again. 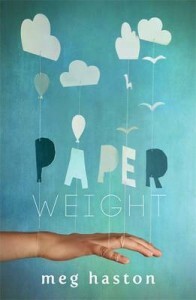 This book has potential to win awards and would make a gorgeous film. Highly recommended. 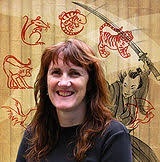 Click here for more information on Elise Hurst. We bookworms have a wonderful advantage when it comes to Christmas time. When humans say, “Soooo, what do you want for Christmas?” the only answer to screech at them is “BOOKS! 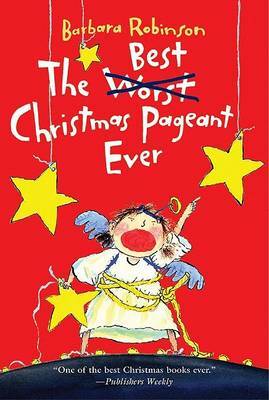 BOOKS!” The only real agony comes when writing the perfect Bookish Christmas List. Because you don’t want to forget any excellent ones, right?! 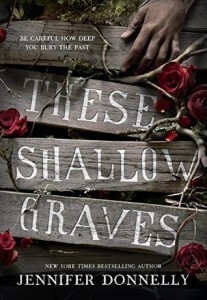 Today I have a list of YA books that should probably definitely be on your list too. Feel free to leave a comment and tell me what you’re most excited about, too! Because how really can one exist without this glorious novel in their hands?!? Illustrations, peoples! Don’t ever think you’re too old. 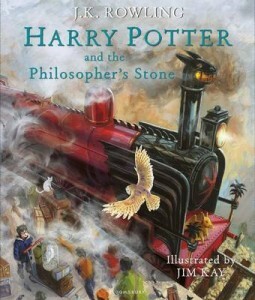 I dearly wish this edition had been around when I first read Harry Potter. 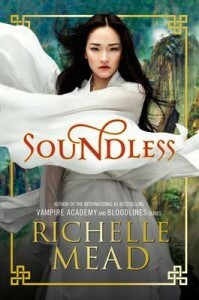 A new book by Richelle Mead! OH HUZZAH! And this one is set in a Chinese-esque fantasy world were everyone is deaf. Intrigued? I think yes. 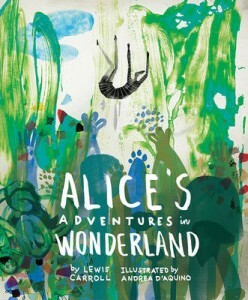 This is the most beautiful version of Lewis Carroll’s famous Wonderland ever. I’m entirely sure it is. I believe it even has a few illustrations inside (!!) which I am so up for. 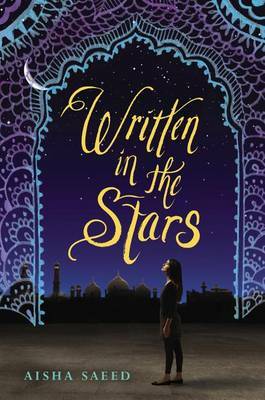 Cover love aside (but not too far aside because let’s face it, this book is gorgeous) I really want to read this one because its about a Pakastani girl who is being forced into an arranged marriage. It’s about destiny and it sounds like an incredible story. 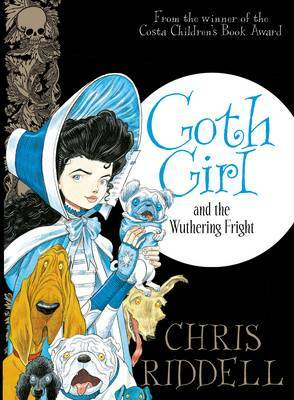 All I heard was “for fans of Coraline” and then it was on my list immediately. 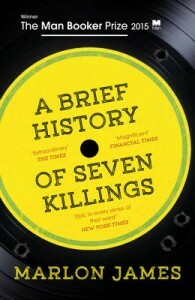 Although I did deign to go back and read the blurb later. The back cover promises wasp queens and brothers saving brothers and explores disabilities and dreams and fears. Does that not sound entirely compelling to you? 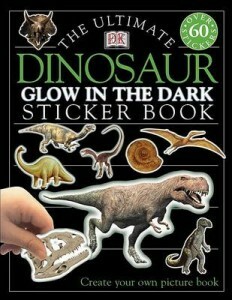 Me = need this book. I was mildly obsessed with the Gold Rush era when I was a small human…and I haven’t quite left the infatuation behind. So naturally I’m dying for this book set in 1849 about a Chinese girl who wants to be a musician, but ends up on the Oregon Trail bound for gold. Plus runaway slaves and cowboys. Say no more. This book needs me. 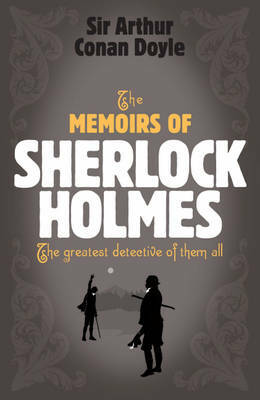 Sherlock Holmes is one of my favourite things of ever and I’ve read countless retellings! So naturally I want to read more. Plus this version is by the point of “Mori” (Moriarty!) who is also genderbent and a girl! IS THIS REAL LIFE!? 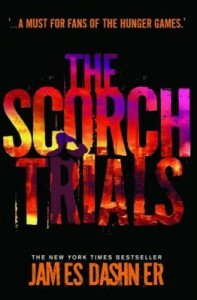 I’m so keen for this book! An absent minded Grim Reaper? An overzealous angel? DEATH PERSONIFIED?!? This book has my name written all over it basically. 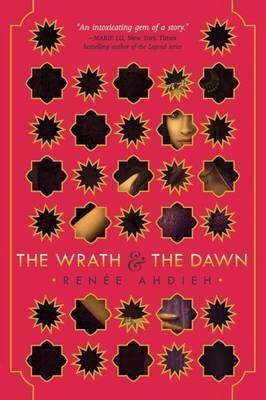 After the marvellousness that is The Book Thief and The Game of Love and Death, I’m all for games where supernatural eternities are personified. And of course I’m eager to read Rainbow Rowell’s latest book! Remember the fabulousness that is Fangirl?! Well, the fanfic that the protagonist of Fangirl wrote…is now its own book! So it’s like a book from inside a book?! 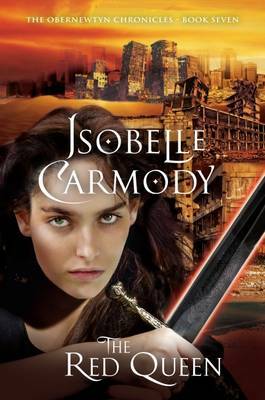 I love fantasy and dystopian…but have I ever read one set in India? Negatory. So! 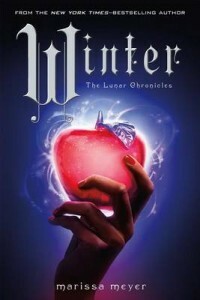 I’m absolutely dying for this beautiful looking book! 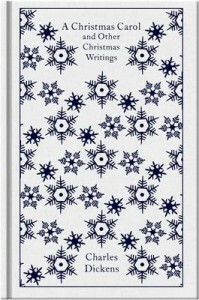 For more Bookish Christmas Wishlist inspiration, head over to Boomerang Book’s Christmas guides!